Hello! I hope you all are having a great fall season so far. I know it’s been awhile since I’ve posted anything on the blog. I’ve recently started working with two new clients and have been quite busy! That’s my husband, Greg, who agreed to tag along. After dropping off the kids with Greg’s parents in Chapel Hill (thanks again, Ann and Bob! ), we headed to High Point. We were only there a little over 24 hours, but I definitely got an eyeful. There was so much I didn’t even get to see. I had to pace both myself and Greg (who was a trooper but was definitely not as excited as I was to be there). We did go out to dinner on Saturday night at a great little restaurant in Greensboro called Undercurrent. I highly recommend it if you’re ever in the area. Back to the show. Here are a few things that caught my eye. So much great art! Mostly prints, but some original too. I really love the ones above and want to use them in Owen’s room at some point. 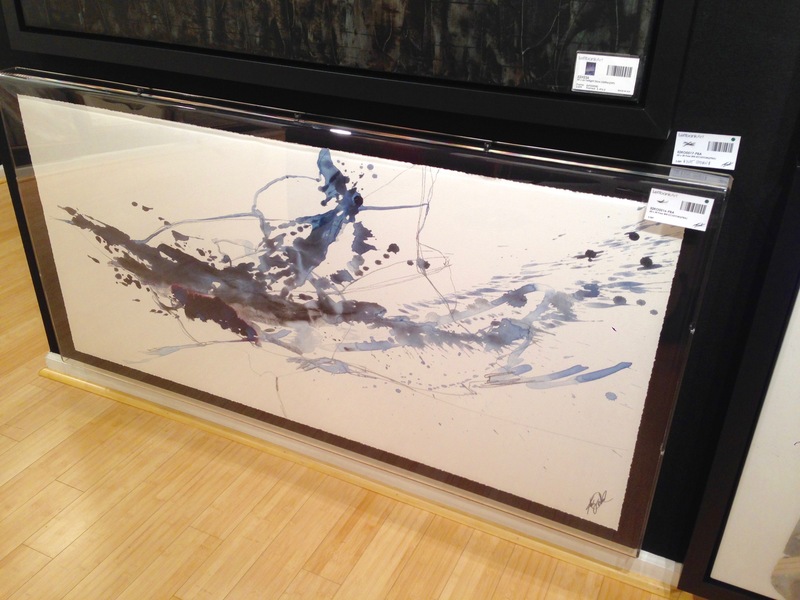 I saw a ton of art that was framed in a floating style in thick plexiglass/lucite. It was a very modern, clean look that I really liked and that felt new and fresh. And the rugs! So many great rugs. 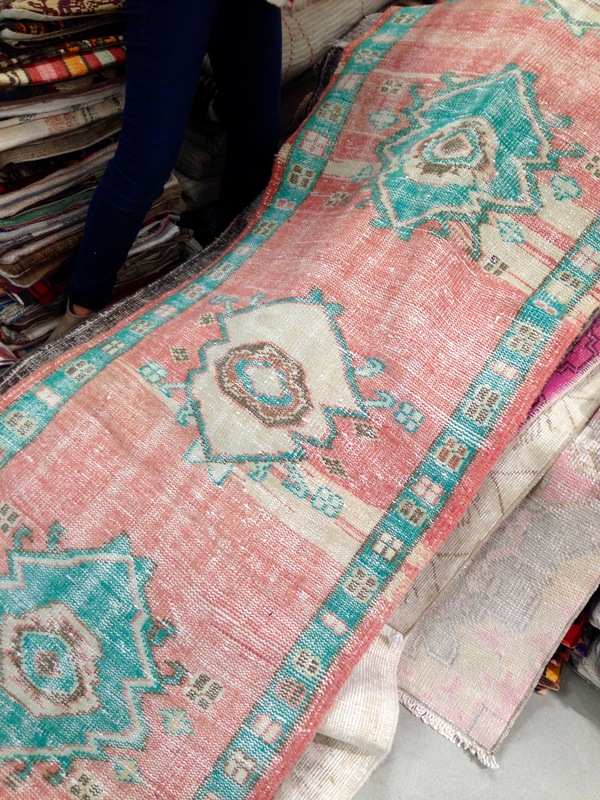 This vendor was packed and had designers grabbing rugs off the stacks in a bit of a frenzy. 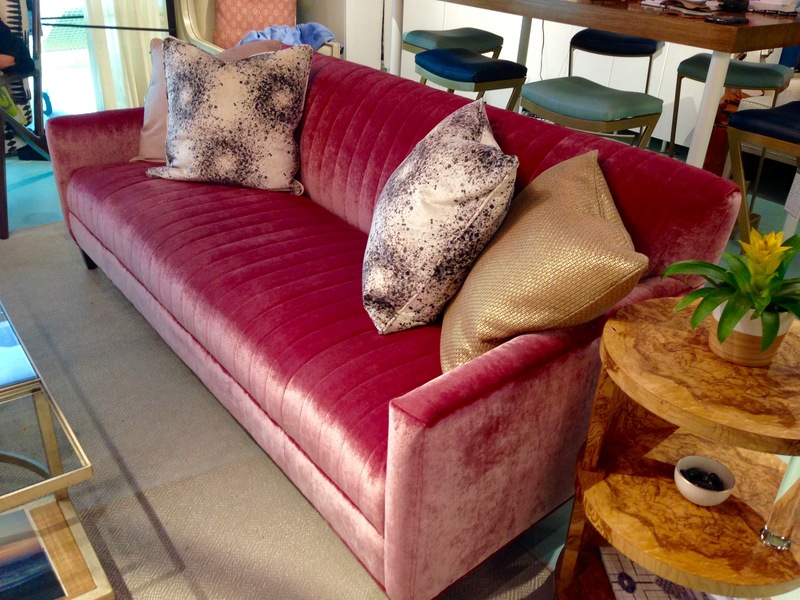 Beautiful showrooms all over, and blue and pink are still quite popular. 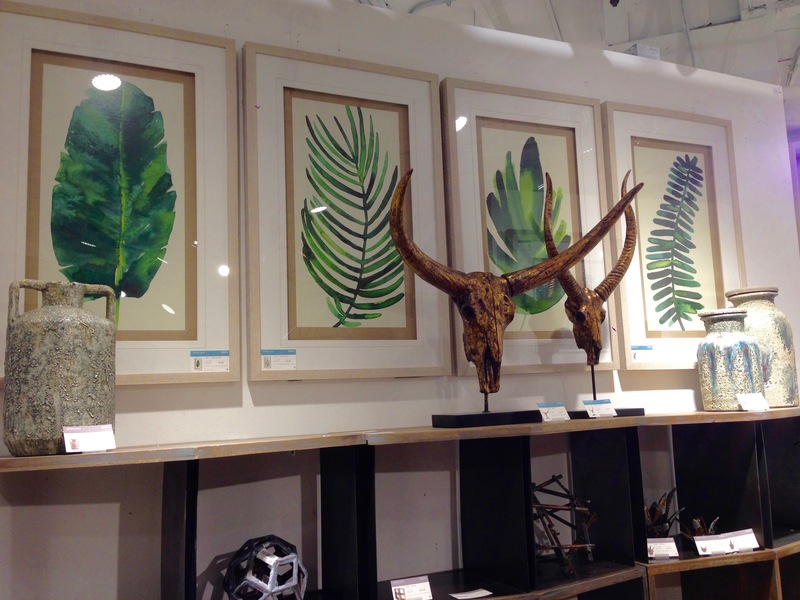 A modern take on botanicals. 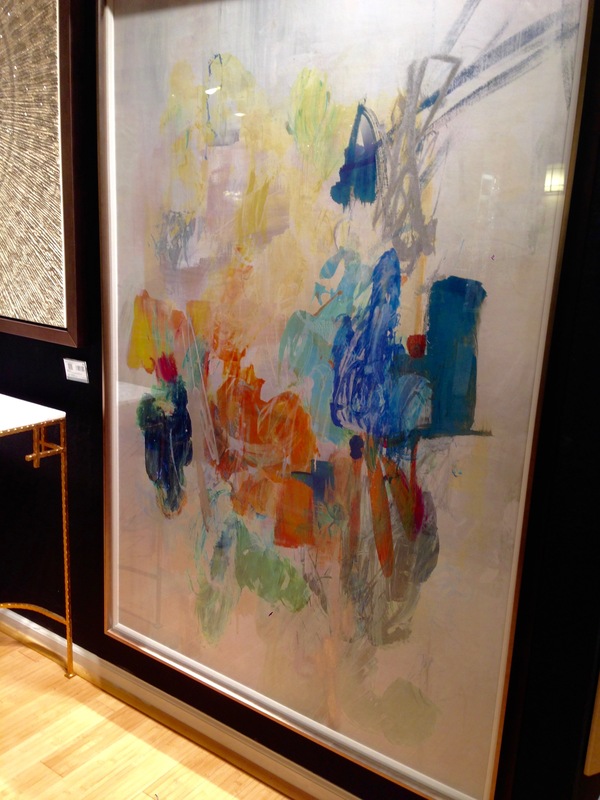 Tons of oversized, large art pieces as well. On Sunday, we took a shuttle “off campus” to the Lexington showroom. It’s about a 10 minute drive from the main showroom area. 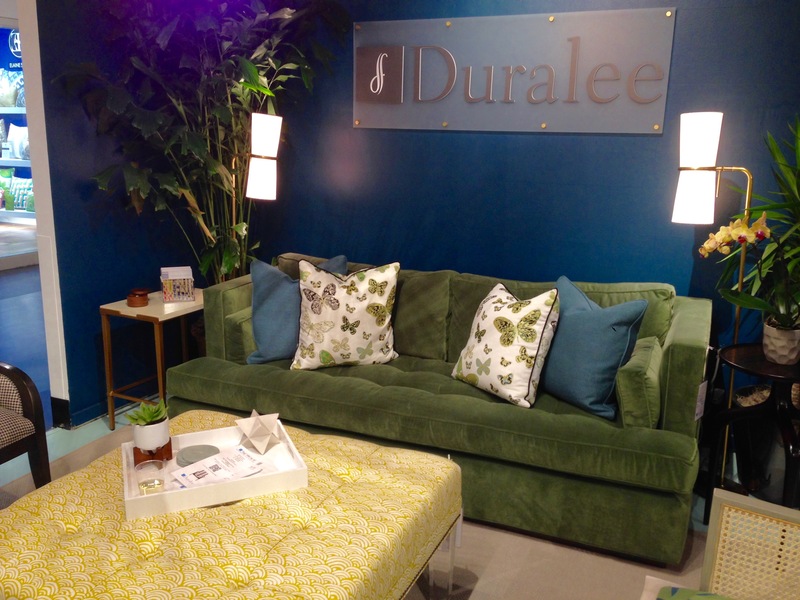 I loved all the velvet at Duralee and the tufting in this couch. I’ll hopefully go back down in the spring and get to see even more. Hope you enjoyed the pictures! 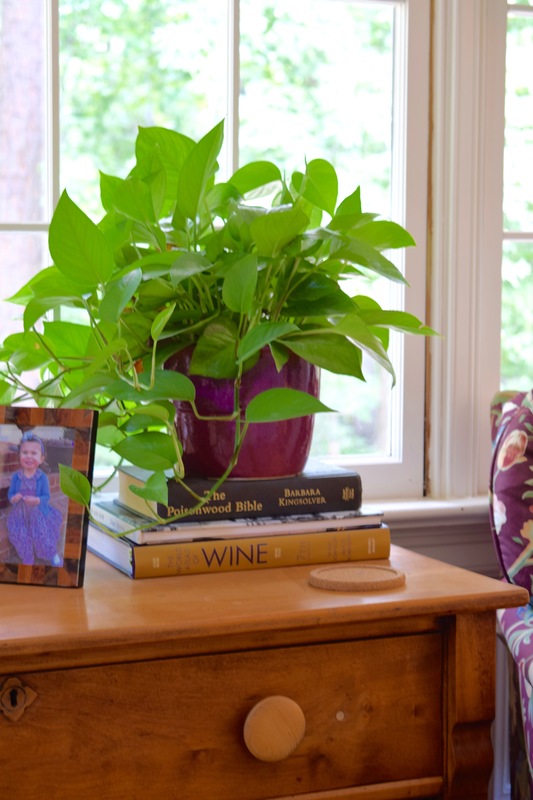 If you’ve been reading my blog posts for a while, you may have noticed that I almost always have a plant or two in each room. I love the idea of bringing a little bit of nature inside, and plants also help to remove toxins from the air. A win-win, right? Let me preface this post by admitting that I am in no way a plant expert. I just enjoy them and have learned a lot from my mom, who has a much greener thumb than I do. I’ve tried a number of plants over the years and have definitely ended up with my fair share of brown plants. In fact, I have a pair of dead maidenhair ferns sitting on my deck right now waiting to be composted. That being said, I have had good luck with the ones I’m going to reference. 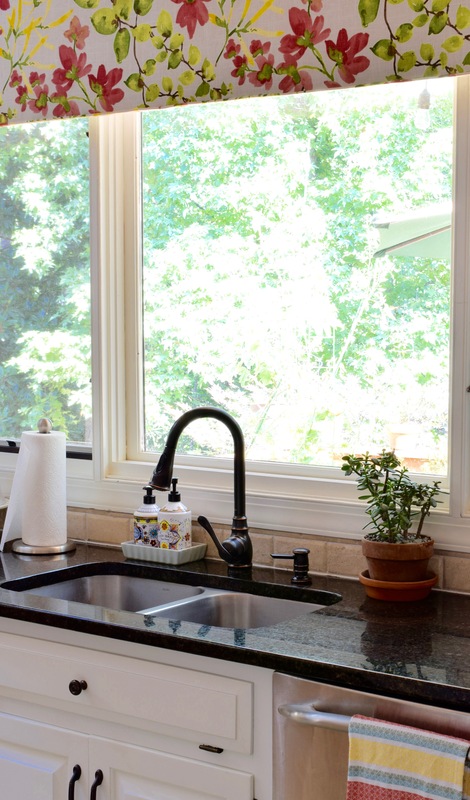 Every house is different of course, and you must take into account the amount of natural light and maintenance (i.e. watering and fertilizing) you are willing to do. Okay, first up is a relative newbie, but it seems to be doing well, so I’m going to consider it a success at this point. This is a Philodendron, and they can get quite large, so I’ll have to move this at some point if it does well over time. I love the large, interesting leaves on this plant, and it’s fairly easy to grow as long as you have bright indirect lighting. These plants have been around forever, of course, but are currently having a moment in the decor world. 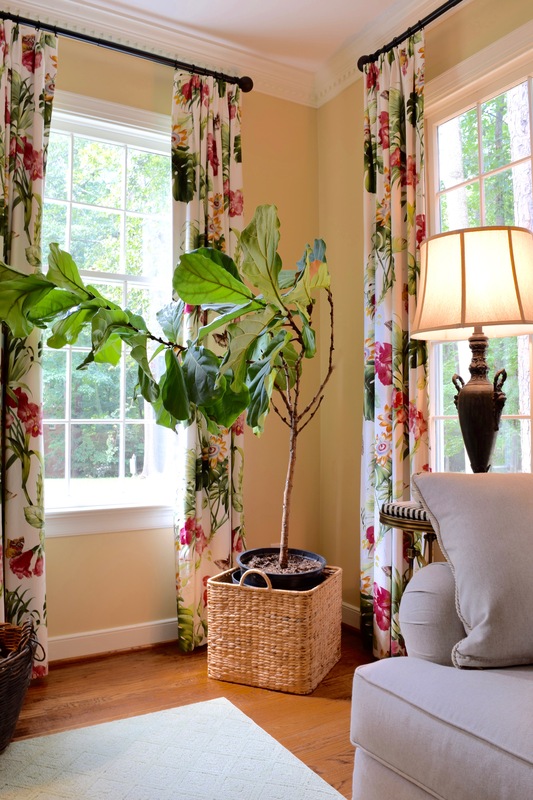 Another large, sculptural plant that has been enjoying a LONG moment in the decor world is the fiddle leaf fig plant. 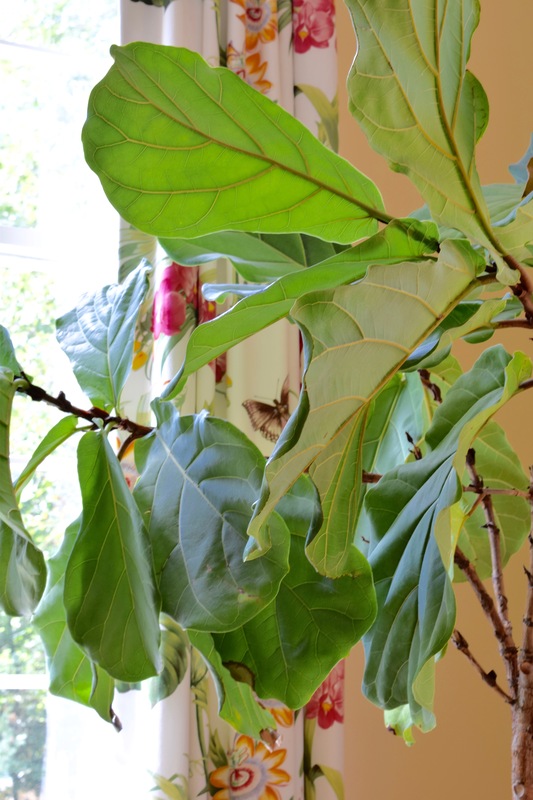 This tree-like plant gets very large and also has large, unique leaves that can add a ton of interest in a space. I have two of them at the moment but did have one die early on. They aren’t cheap either – around $45-65 for a smallish one and upwards from there. In my experience, they like a lot of light and do not like to be moved. Once they’re happy, though, they grow quickly and can really make a room. I’ve had this one for almost five years, and it’s still going strong. Next up is the nearly indestructible ZZ plant. You may have seen these plants in office buildings, because they require very little care and are an attractive plant with a graceful shape. 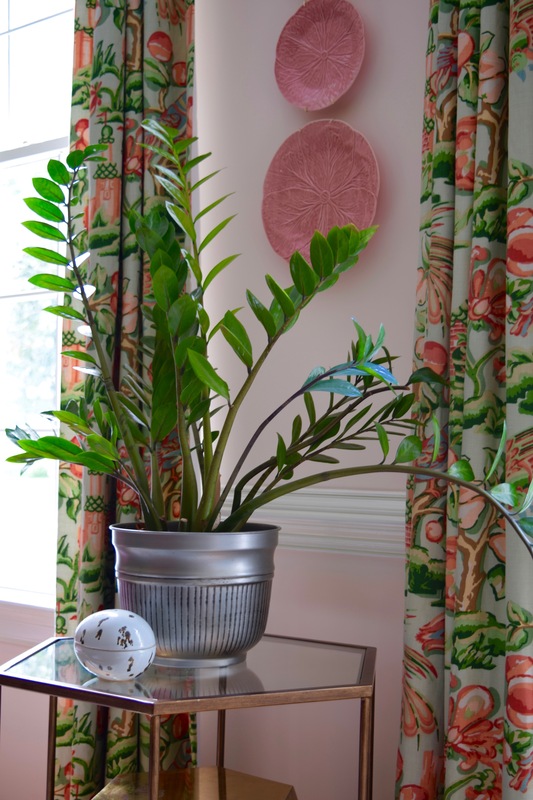 If you have never been able to keep a plant alive, give this one a try. They can live in low light and miss waterings and still look great. I think in the four or so years I’ve had this one, I’ve had to only cut off one dead stem. They leaves are shiny and attractive as well. Next up is the Pothos. A very popular choice, this vining plant can be variegated or all green and looks equally pretty trailing or in a container. They do well in indirect light but can also take some bright light. I use these plants as my “barometers” – when they start to droop, I do a whole house watering. Next up is the Jade plant. 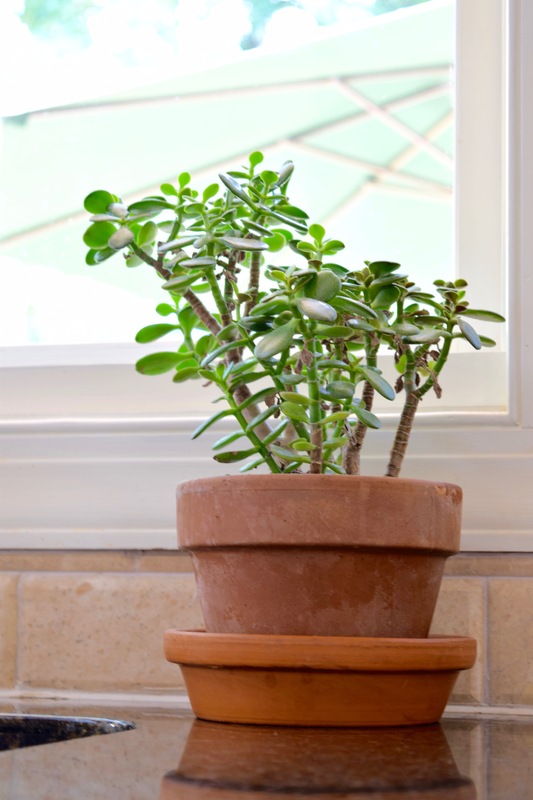 A succulent, these plants require light and irregular waterings. You can tell how your plant is doing based on the leaves – you want them full and shiny – not shriveled or browning. Adjust your waterings if you notice the leaves changing. I’ve actually got a few brown leaves to pick off in this example, whoops. My last selection is another good choice for lower light and less frequent waterings (notice a theme?) – the Snake plant. 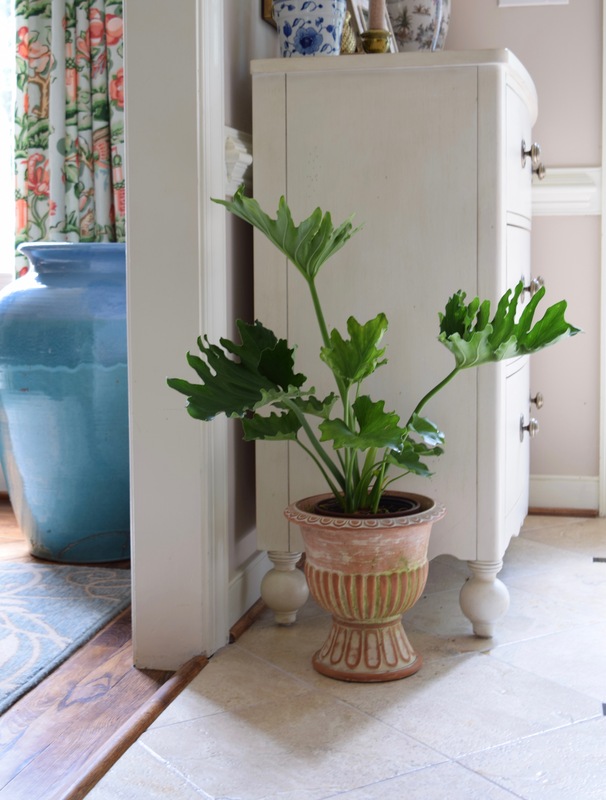 These plants grow tall and straight and add nice height to a room. Let them dry out between waterings and make sure they have good draining. Then just enjoy their pretty sculptural shape. 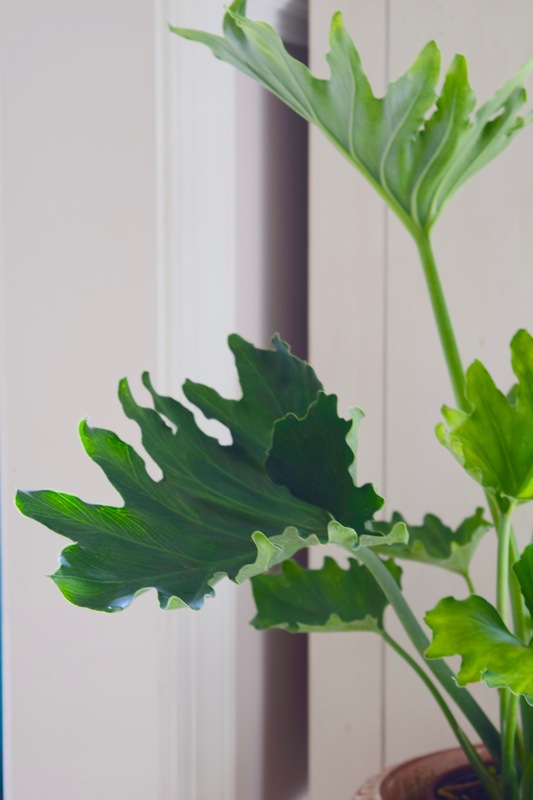 That about wraps up my list … I’ve got a few others, but these are my general “go-to” houseplants. Hope you found the information helpful and are inspired to add one or two to your home. May your thumbs all be green! I never knew how much I would love having a mudroom until we moved to our current home. I didn’t have a mudroom as a “must have” as we were house shopping, but I am super glad we got one. Like all mudrooms, ours is definitely a high traffic area in our house. It connects the garage to our kitchen and also has a half bath/laundry room connected to it. 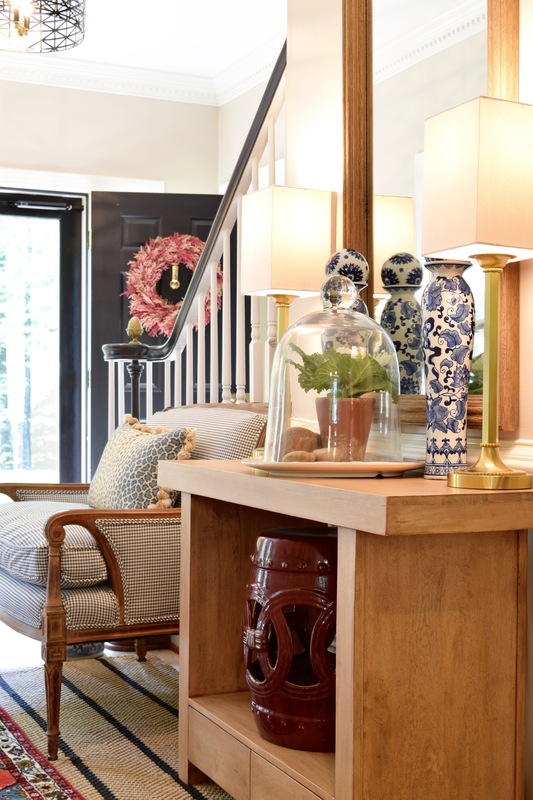 In addition, we have a back staircase that connects the mudroom area to the guest area and office (above the garage). So, it’s a space that we see every day, multiple times a day. It’s fundamentally a utilitarian space, but that doesn’t mean it shouldn’t look good. At the same time, I didn’t want to spend a lot of money decorating the space. 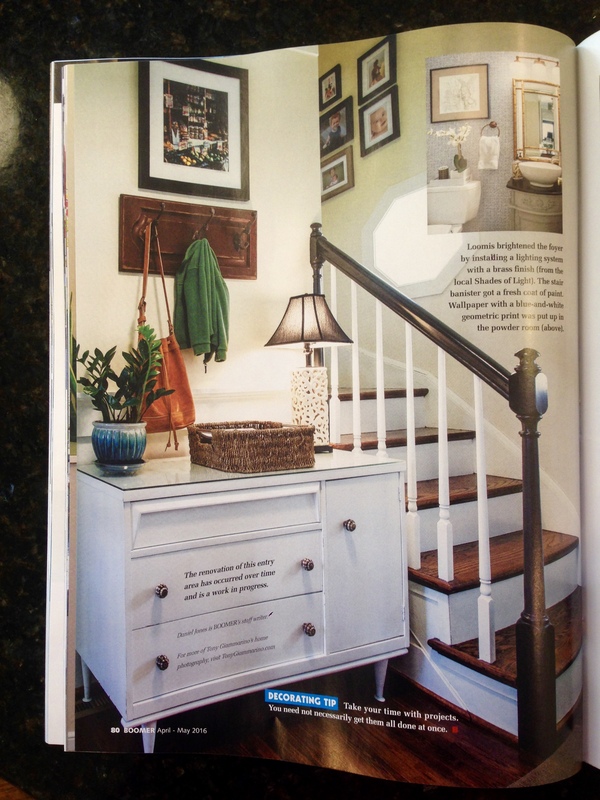 Would I love to have a mudroom like those in newly constructed homes – with all the beautiful built-ins? Absolutely. But, that’s not in the budget, and you have to prioritize, right? As much as it’s used, it’s obviously not an area where we congregate for long like the kitchen or family room. Storage – yes, we do have a small closet in the mudroom, but it’s not enough to house off-season and current items for a family of four. So, I picked up a mid-century piece from Craigslist, had it professionally lacquered, and replaced the knobs with ones from Anthropologie. It houses hats, junk drawer items, extra purses, etc. It’s not very organized at the moment, so no pictures of the inside, ha! 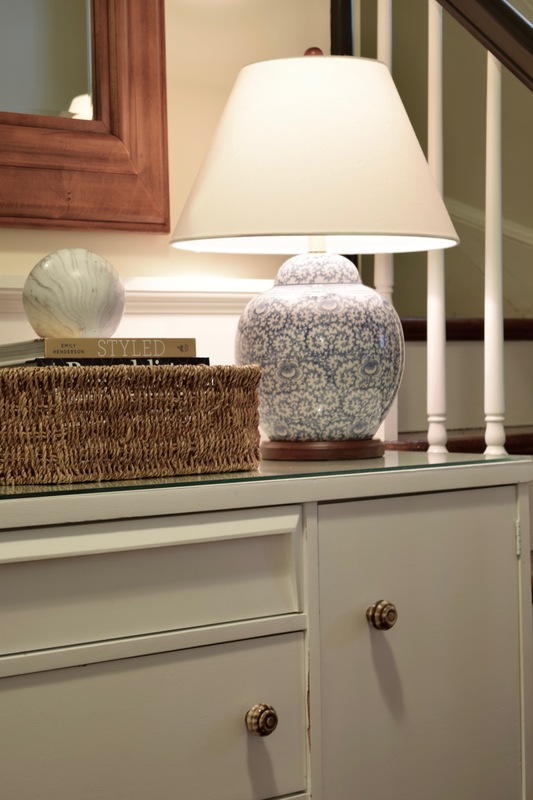 Lighting – I always like to include a lamp in addition to overhead lighting, so I found this Ralph Lauren lamp at HomeGoods and like to turn it on in the evenings (without the overhead on). 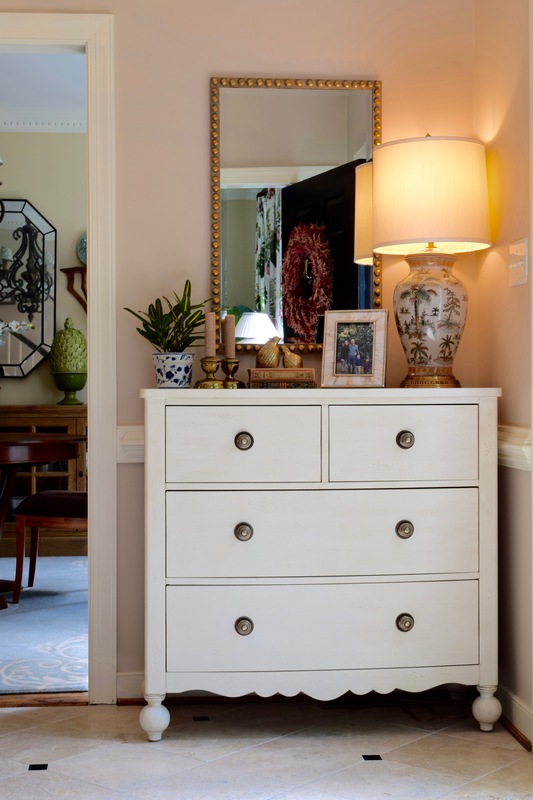 A mirror – pretty obvious, for checks before walking out the door. You do it too, right? 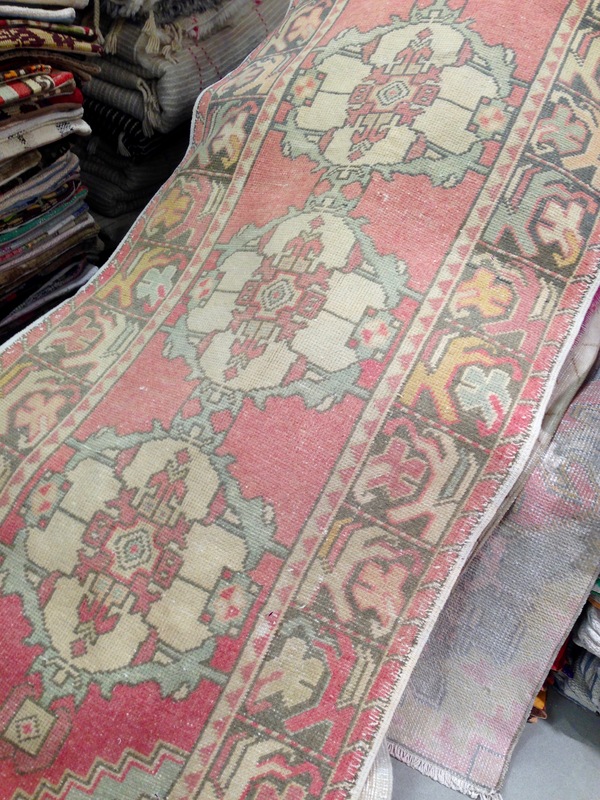 A rug – to soften the floor for little bottoms putting on shoes. 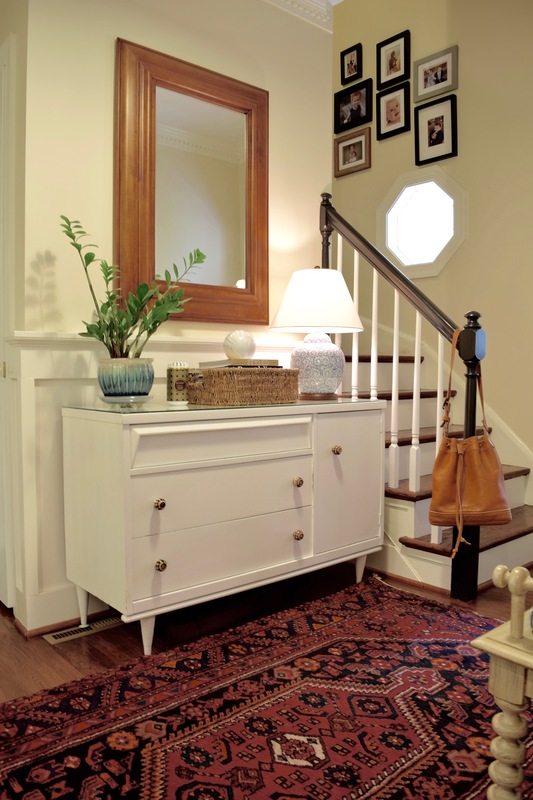 This rug in particular also helps to hide dirt (which is a constant, given that it’s a mudroom). 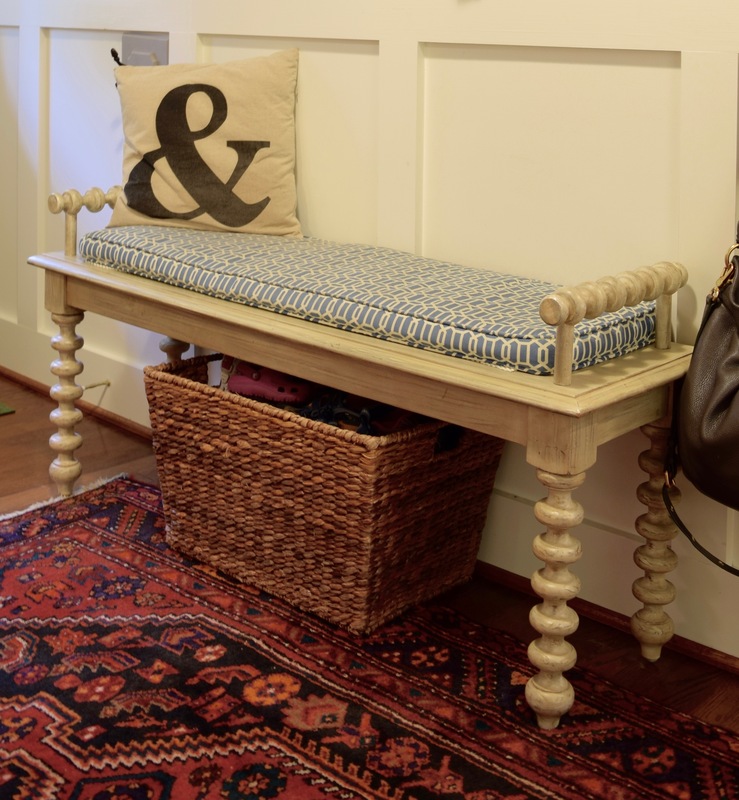 A bench – a good spot to sit and put on shoes before heading out. Though I’m generally the type to wear shoes inside throughout the house (I know, it’s not good to do, but I’m so used to it), so I don’t use it all that much. Hooks – for hanging items. In this picture, I have my purse hanging on the hook, but these hooks are really for the kids to hang their school bags and coats on once school starts. Organizer system – for keys, mail, magazines, etc. 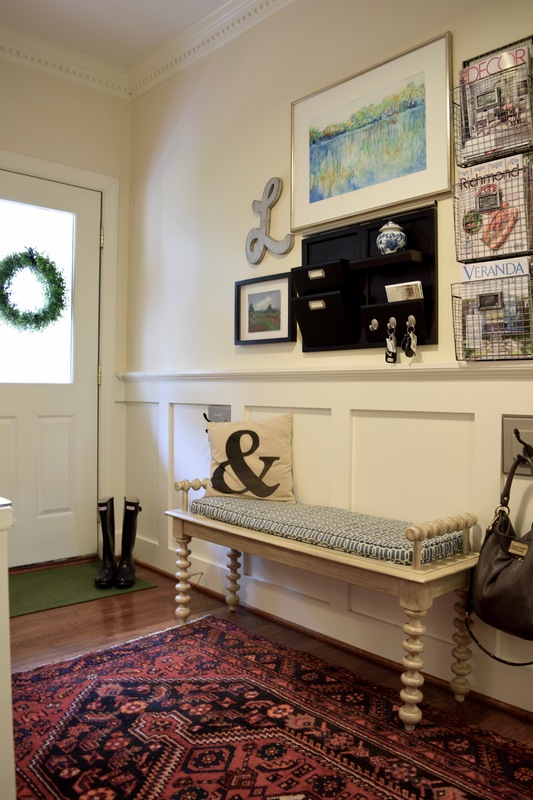 Art – I know it’s just a mudroom, but make it pretty! Hang something that will make you smile, especially since you’ll pass by it so often. 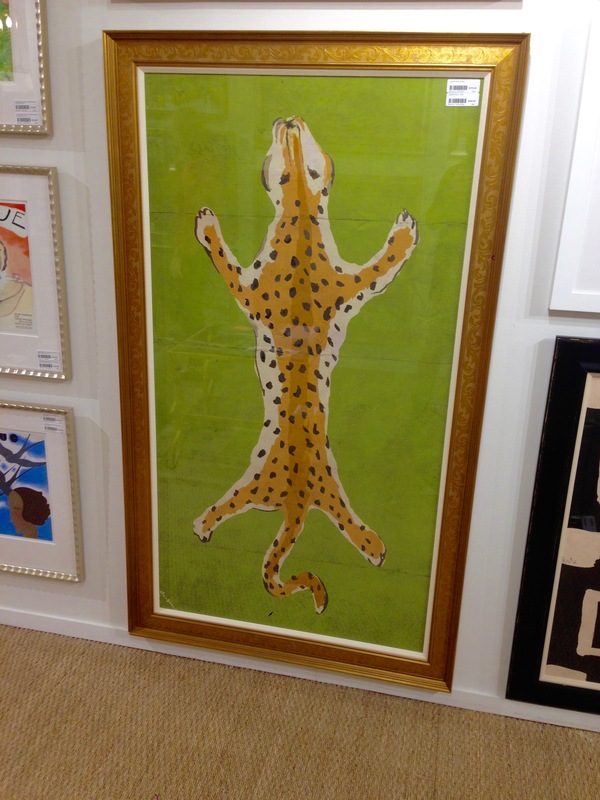 I bought the large picture at Crossroads Art in Richmond. 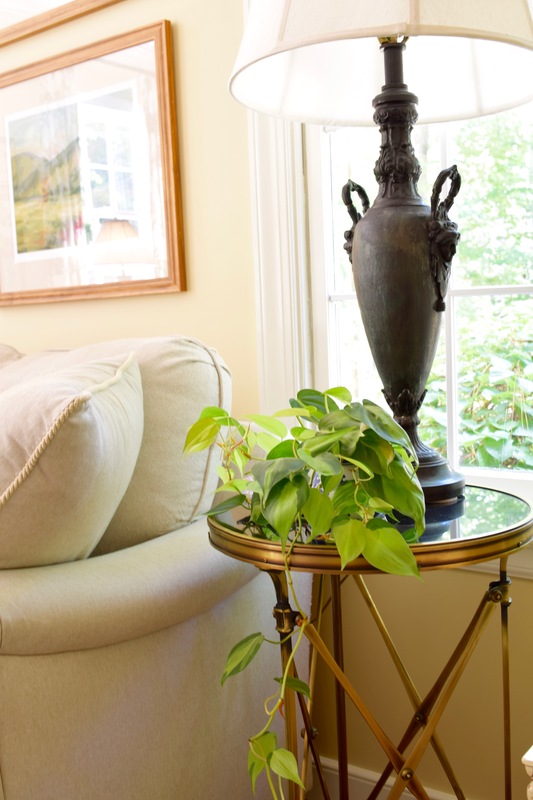 Something green – for me, a plant (or two) is a must for every room! 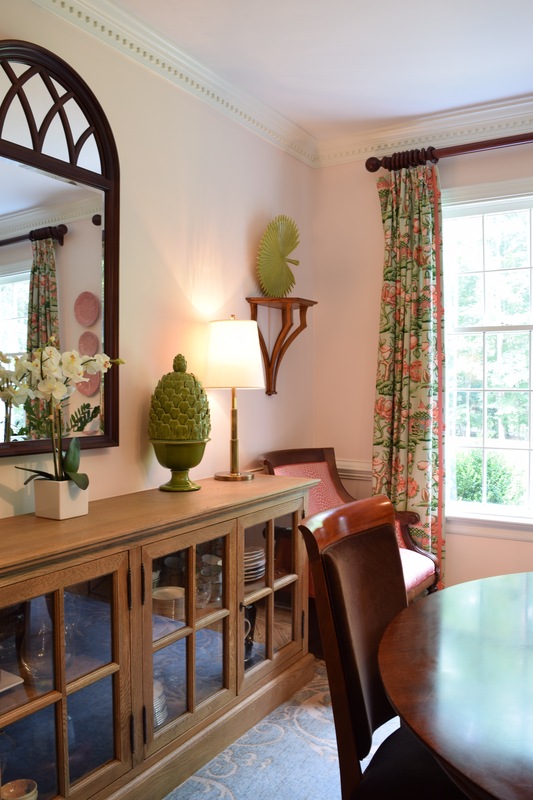 Architectural interest, if possible – we did add the board and batten in this room to help liven it up a bit. Wallpaper could also work. 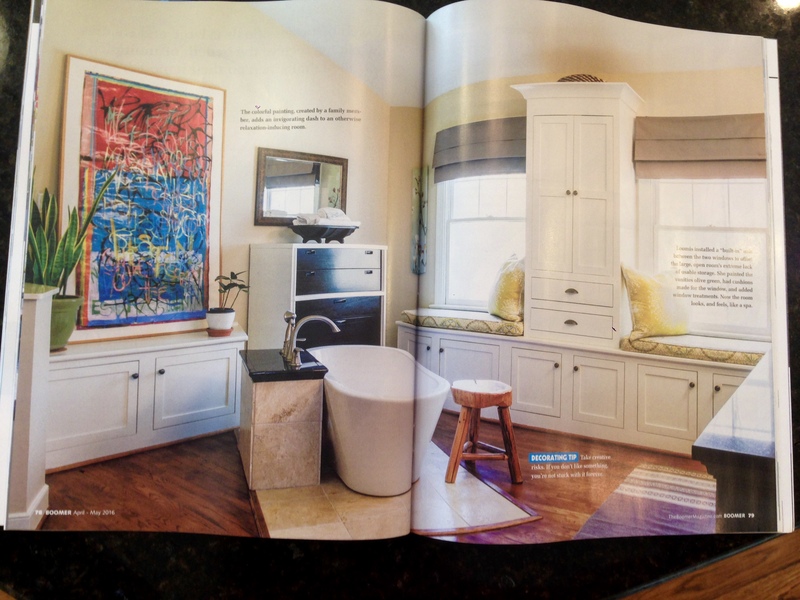 Okay, that’s my round-up of mudroom must-haves. Am I missing anything? What works for your family? The main thing that bothered me about the “before” dining room was the paint color, which was here when we moved in and wasn’t terrible, so we lived with it for a while. I didn’t mind the pale yellow color above the chair rail, but the bottom of the chair rail was painted a gold yellow color that felt too traditional and didn’t go with my drapes. 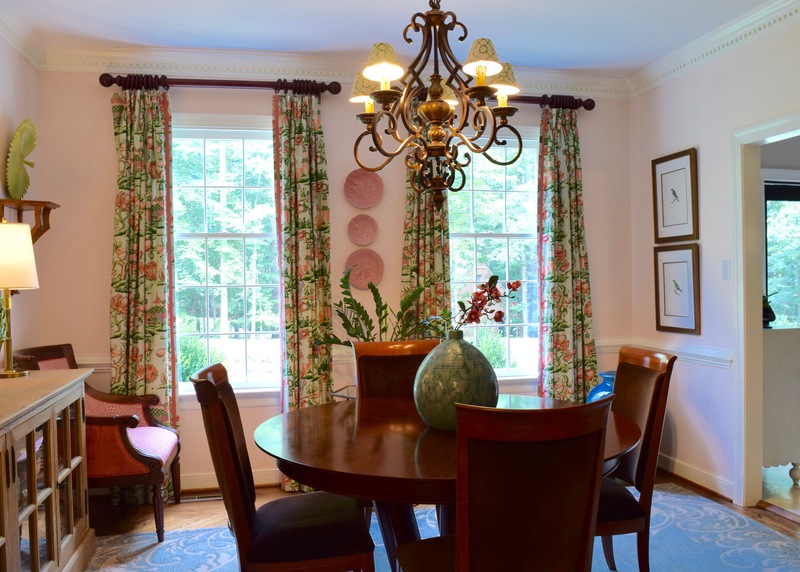 I also found these great salmon/pink chairs that I wanted to use in here to compliment the drapes, so I knew I wanted to do a pink color on the walls. So one afternoon, I, along with some little helpers, painted a few samples on cardboard and moved them around the room for a few days to see which one looked best. 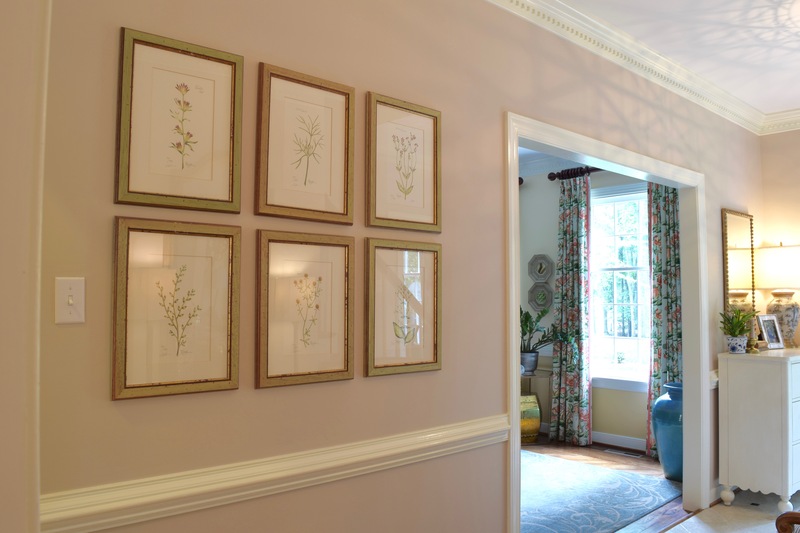 I was torn between Farrow & Ball’s Middleton Pink and Benjamin Moore’s Warm Blush. I ended up picking Warm Blush and am happy with how it turned out. It’s very subtle but definitely has a pink tone to it. I think this picture shows the true paint color best. 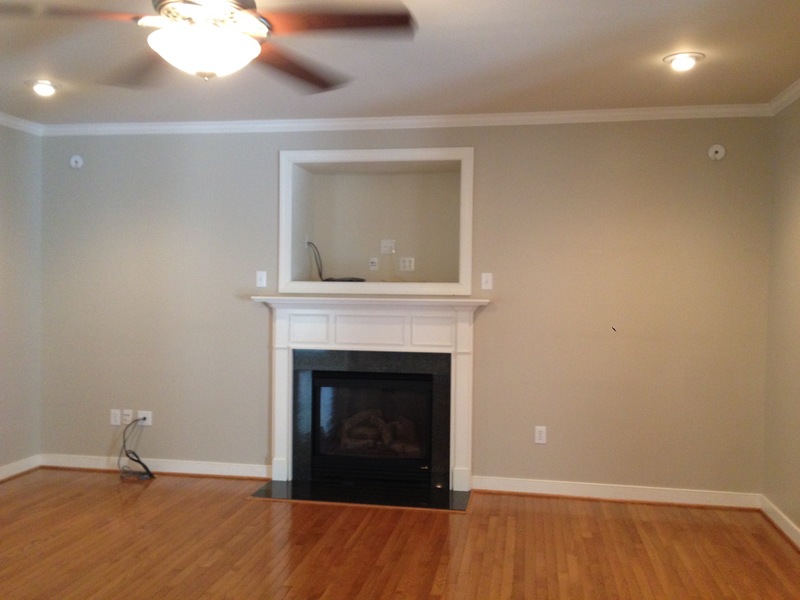 I also didn’t love the antiqued mirror shown in the “before” picture in this room. 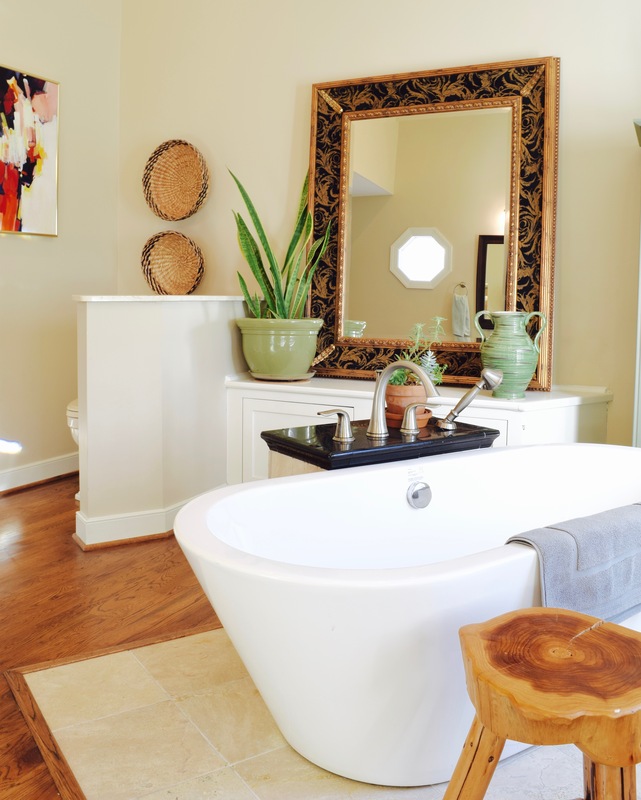 I still really like it and think we’ll use it in the family room, but in this space (which can feel dark), I wanted a mirror that would reflect more light around in the room and also showcase the scale of the ceilings (9 feet). 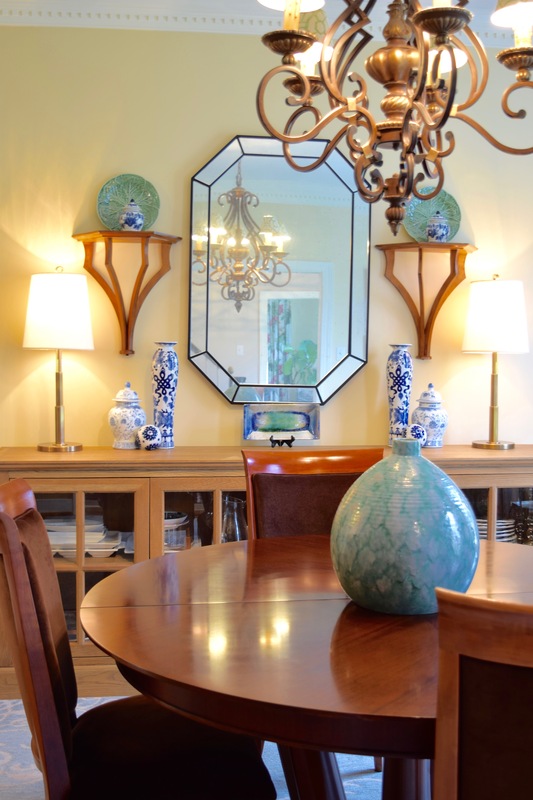 So, I ended up with a vintage Ethan Allen mirror over the sideboard. 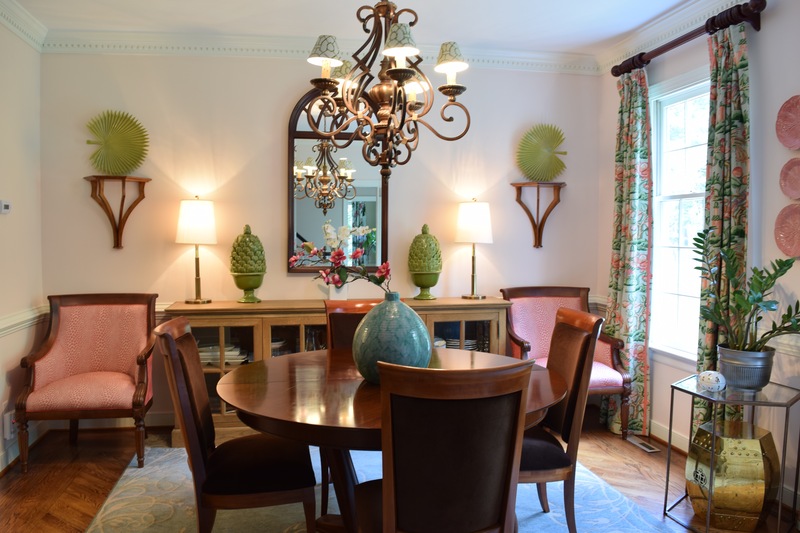 I moved the wall sconces over the chairs and added a few accessories to bring out the green tones in the drapes. 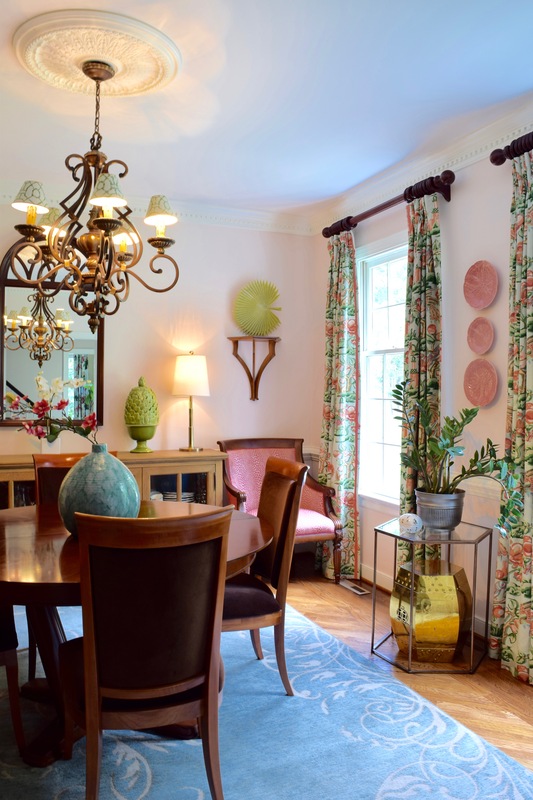 The drapes, which I love, also have some blues in the pattern, so I’ve got a bit of blue in the room as well, mostly in the rug and the large floor vase. So, that should do it, I hope! 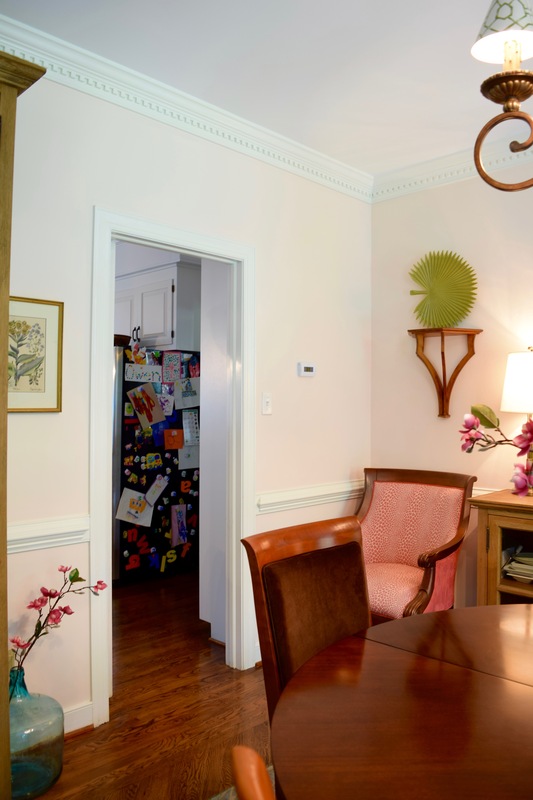 Oh, and one last thing – I tried to take a picture of the other side of the room and laughed at the view of our refrigerator through the doorway. I’m definitely not a minimalist when it comes to preschool artwork, ha! Hope you all are ready for a fun July 4th weekend! I know it’s been a while since I’ve written a post, so I wanted to get something out before the break. 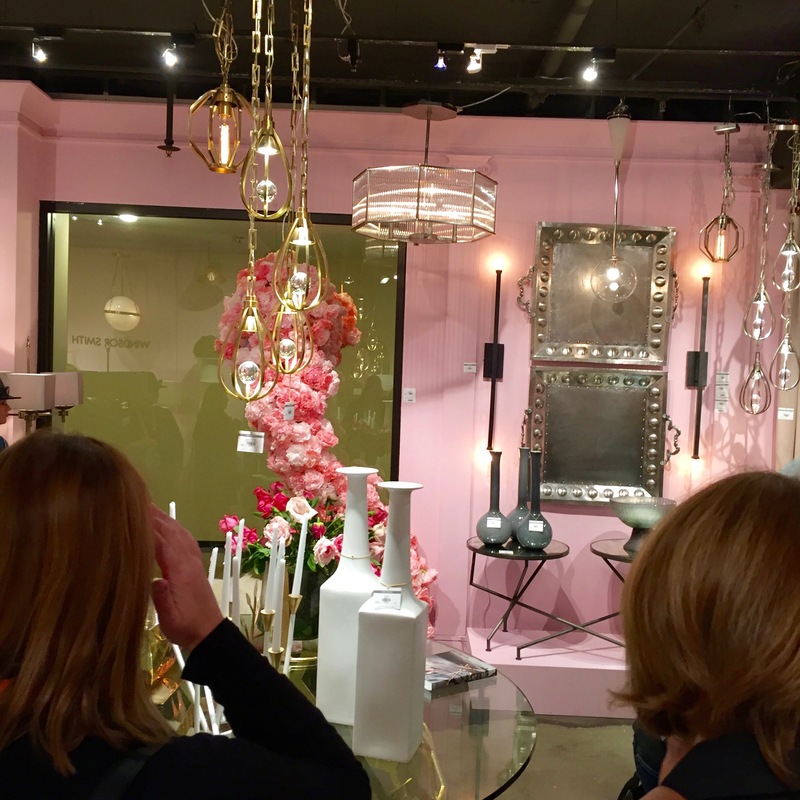 The other day I was at the Designer’s Market here in Richmond (a showroom for designers with “to the trade” resources, i.e. 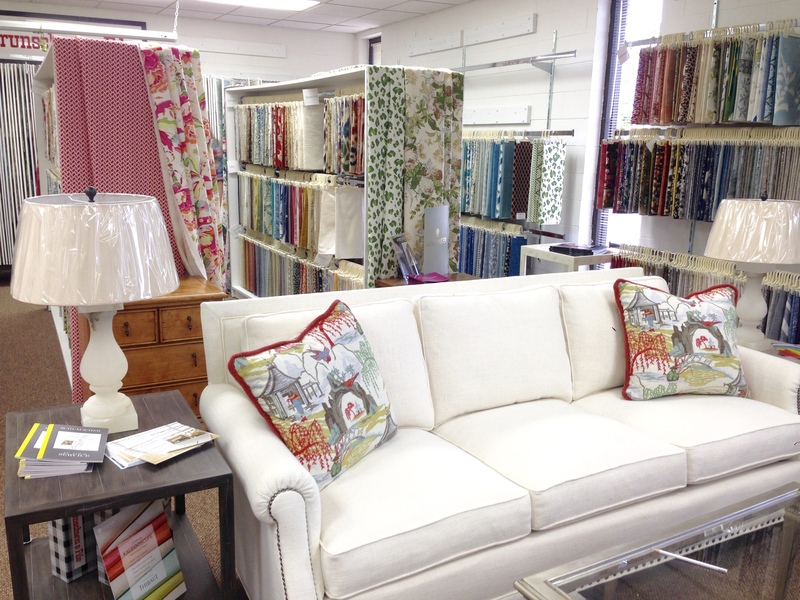 fabric, wallpaper, furniture, flooring, accessories, etc). 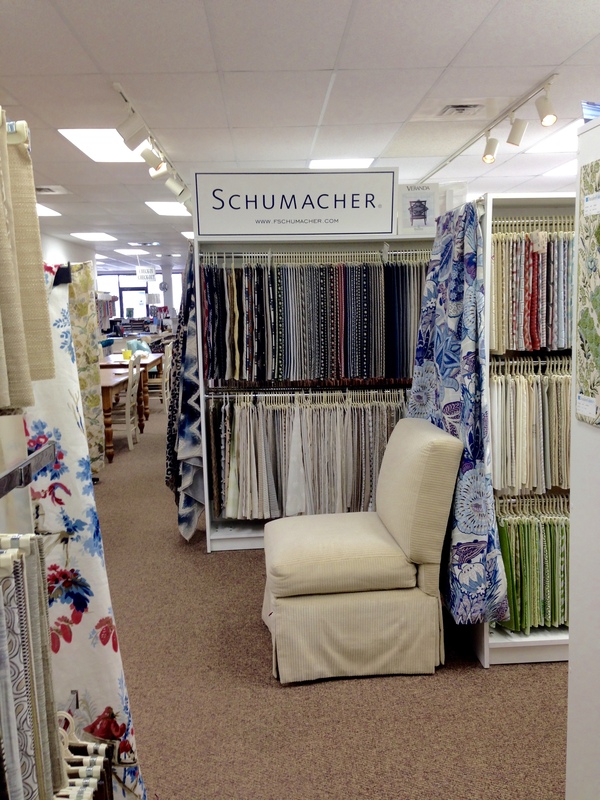 We are lucky to have a designer showroom in Richmond, and every time I’m there, I’m just overwhelmed by the rows and rows of beautiful fabrics. 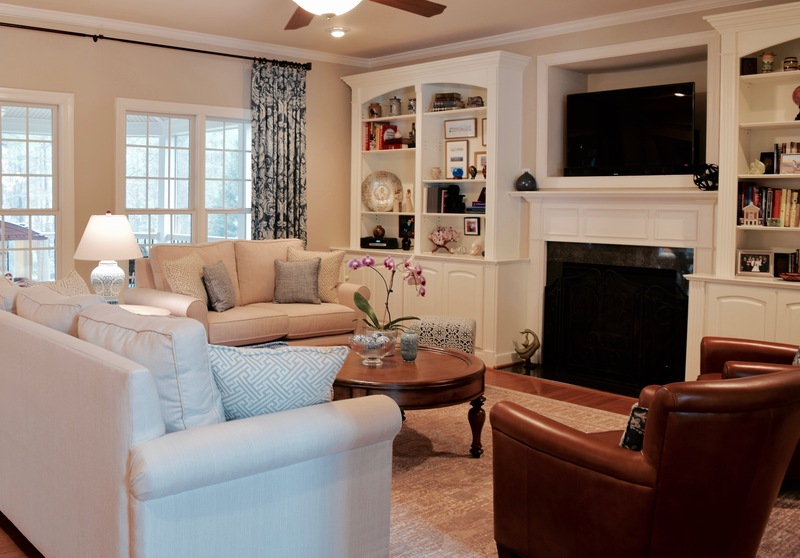 I am a huge fan of using custom pieces (draperies/pillows/upholstered furniture) in a room to get a truly unique, personalized space. 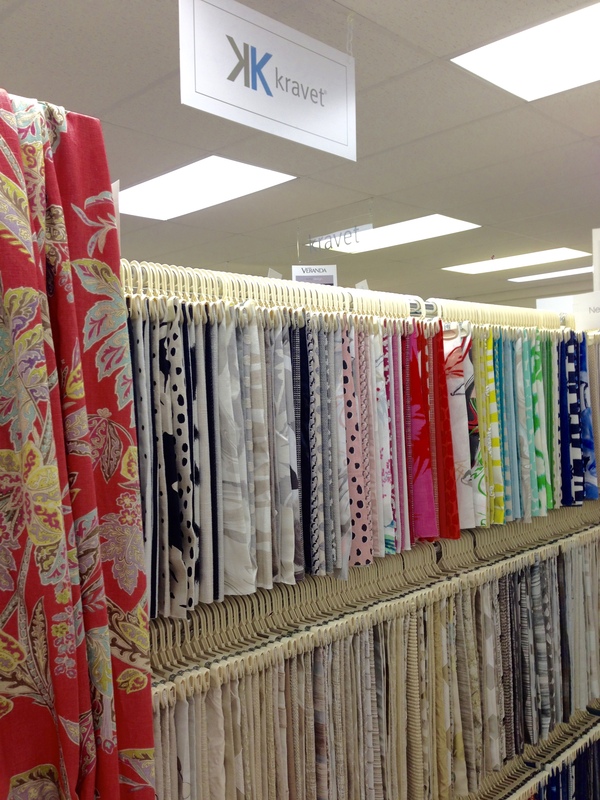 Plus, it’s just so much fun to pick out fabrics! Although I was at the market the other day to pick out wallpaper samples for a client, I thought I would take a few minutes and compile a “collection” of some of my favorite fabrics (some new, others classics). Beautiful, right?! Have a favorite? If you like something and want to know how it could work in your house, let me know! I’m always happy to take clients on trips to the showroom. 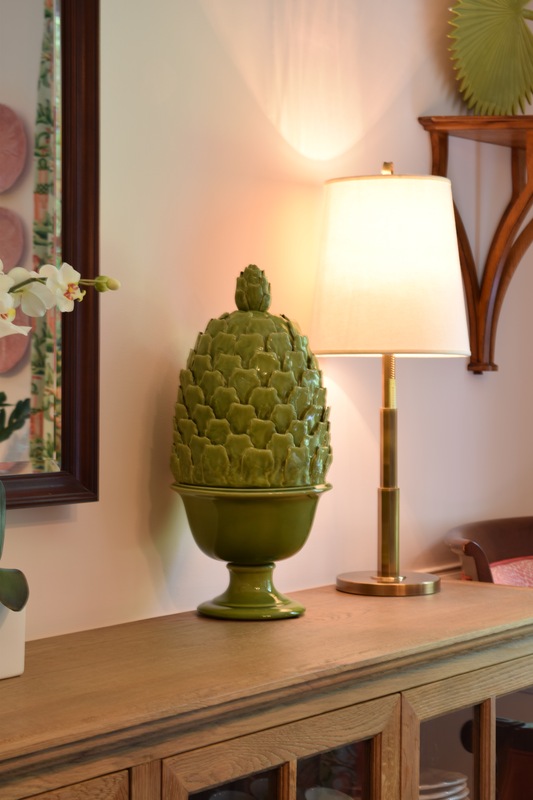 My latest personal project has been doing a little updating to our front entry foyer. 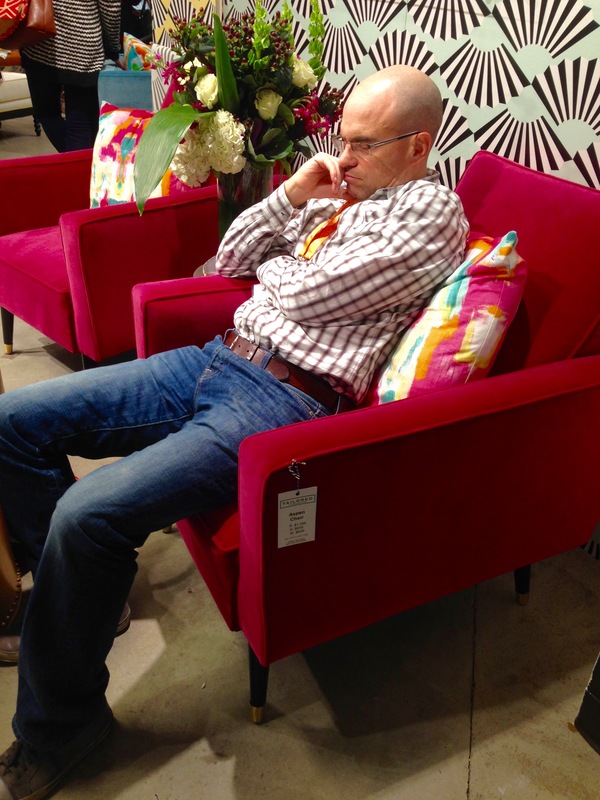 I’ve been on the hunt for a small scale settee for our foyer for some time now but hadn’t had any luck. 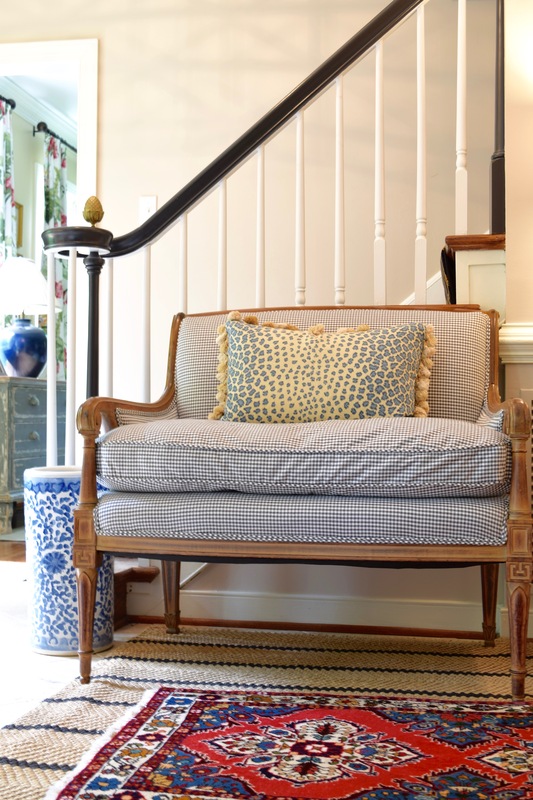 One day I was checking out the latest Craigslist postings (I’ve been known to do that …), and I came across a great settee that was the perfect size for our smallish foyer. I bought it the same day it was posted and paid full asking price (something I’m not normally known to do), because I knew it would be perfect. It had great lines and was the perfect size, but it had the original upholstery and needed to have the down cushion reinforced. 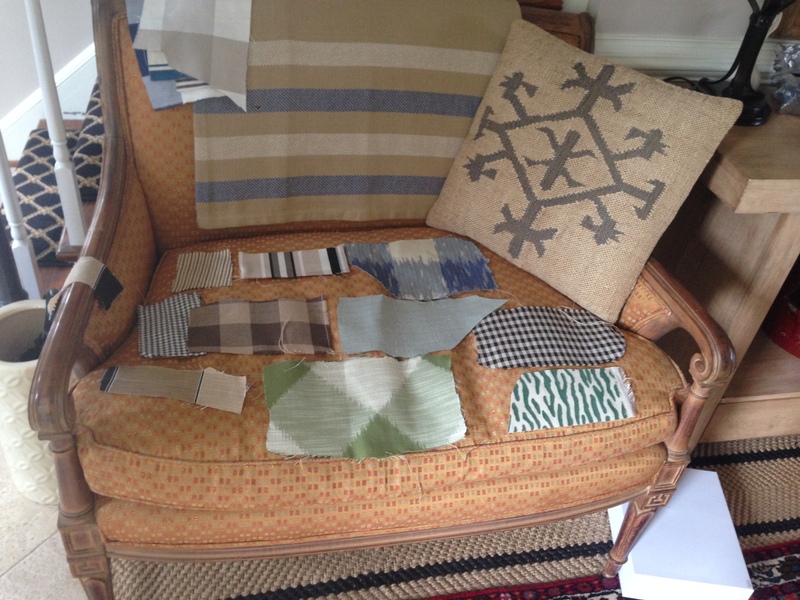 Here’s a “before” shot with some of my fabric selections laid out. Let me tell you, I had the hardest time picking a fabric! So, I needed some teamwork and had my talented mom weigh in on the final selection. She liked the black and white gingham the best, and so did I, so that’s what I selected. I’m really happy with how it turned out – definitely adds some interest to the space but doesn’t compete with the runner and reads as more of a neutral in the space. 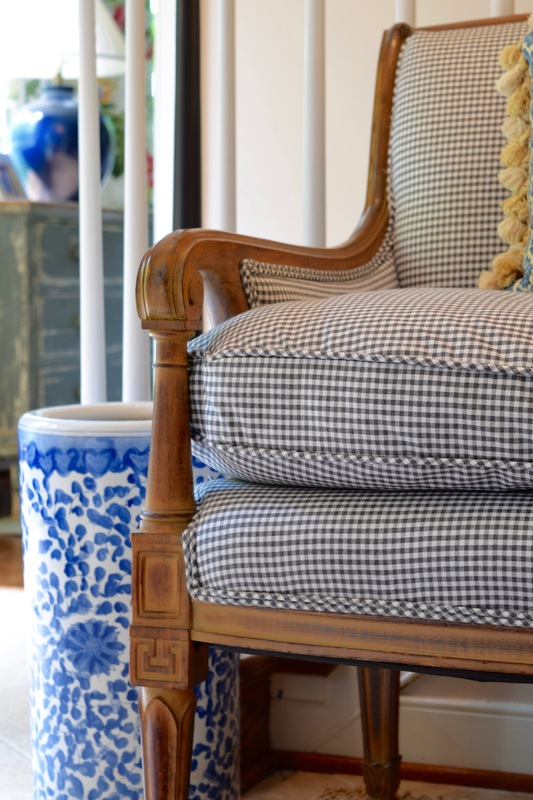 I love the tone of the wood and how it plays against the black and white gingham. 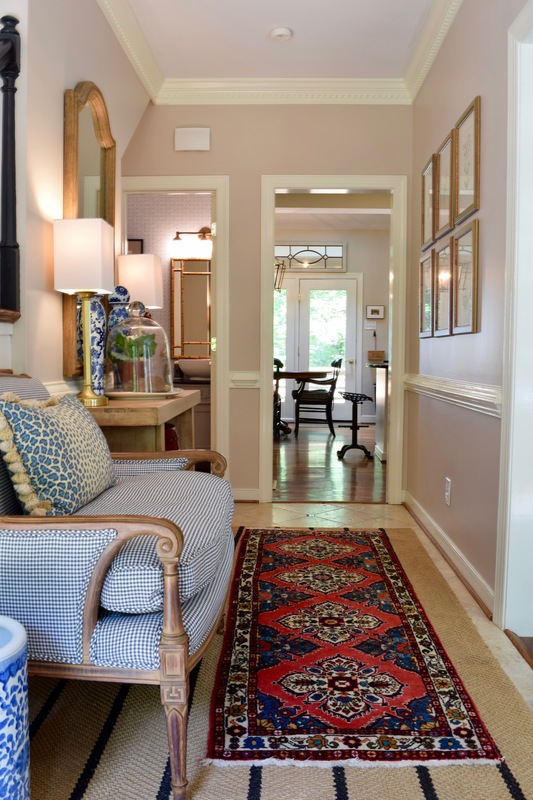 Next to the settee, I updated the lamps and shades, moved the mirror from the family room to the foyer, and picked up the blue and white vases to bring out the blue in the rug and pillow. The spring wreath is from Target. 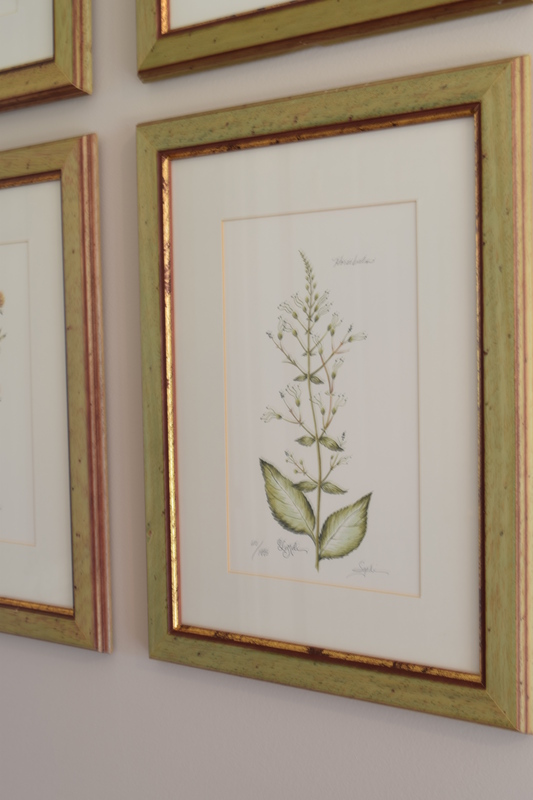 Opposite this wall, I hung a grouping of botanical prints (that were pretty hard to photograph – I did my best!). 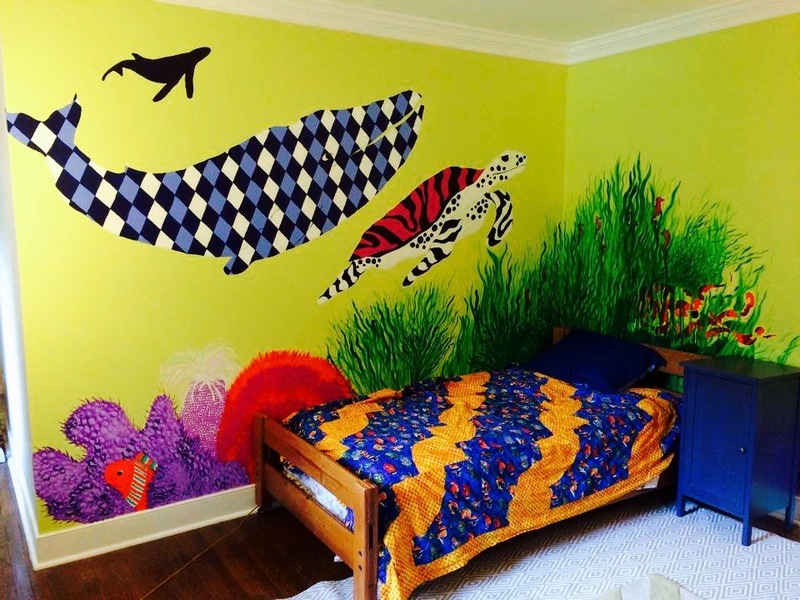 Today, I wanted to highlight the work of a local Richmond artist (and good friend), the talented Betsy Mangum, who designed and painted this great mural for a child’s room. Here’s the backstory. 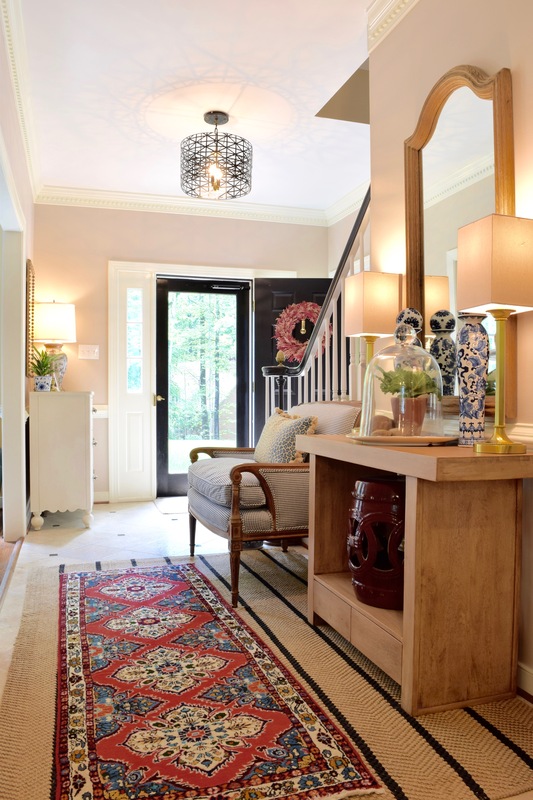 A few months ago, I was approached by an existing client (I worked on her office, their master bedroom, and their foyer). It turns out her young son was hoping for some personalization for his bedroom in their new(ish) home. He was (and let’s hope still is) very interested in sea animals and ocean life. My client was looking to have a wall mural painted in his room to reflect his interests and add tons of personality to the space. 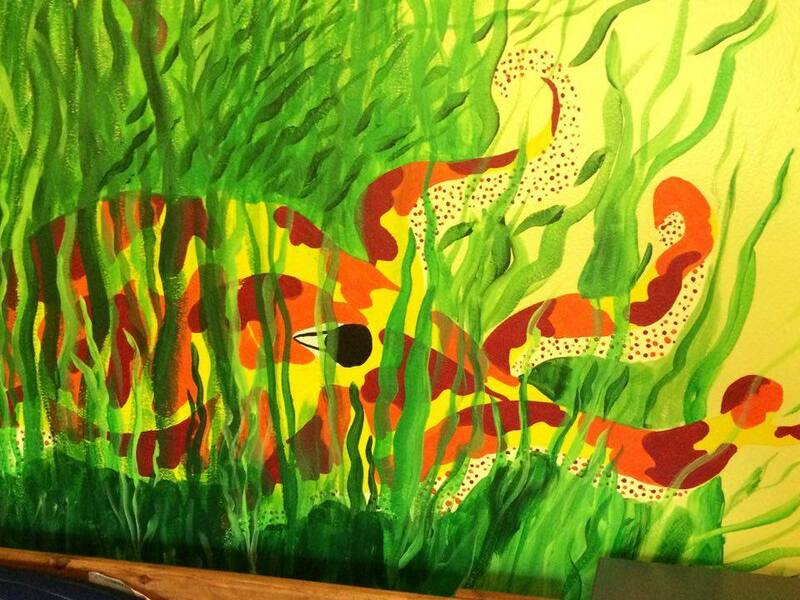 To begin, she had a wall color in mind for the “ocean” – the lime green – but wanted some help planning a design and, of course, needed an artist to prepare drawings for approval and then paint the mural. I immediately thought of Betsy for the job, as she is a wonderful artist who has done many wall murals for her clients in the past. We had a group meeting to brainstorm the overall look of the mural (i.e. the graphic whale, etc. ), and then Betsy prepared drawings that were then approved by the client, and the work began. I love how Betsy designed the mural to stretch over to a second wall. I only have two pictures of the finished project, but I think it turned out great! And, most importantly, our “client” is pretty happy with his new room. 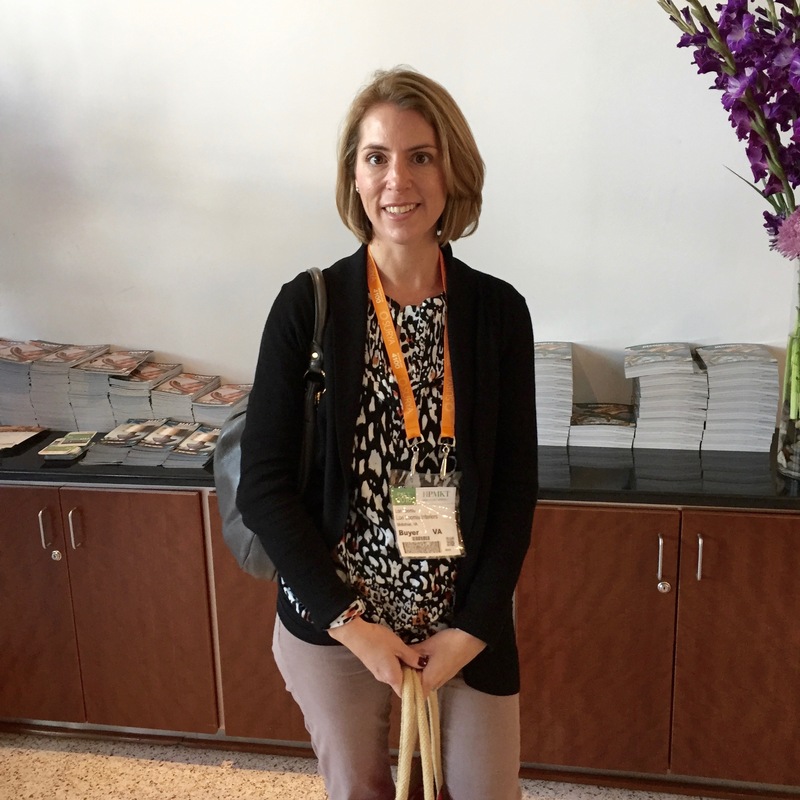 Great job, Betsy! 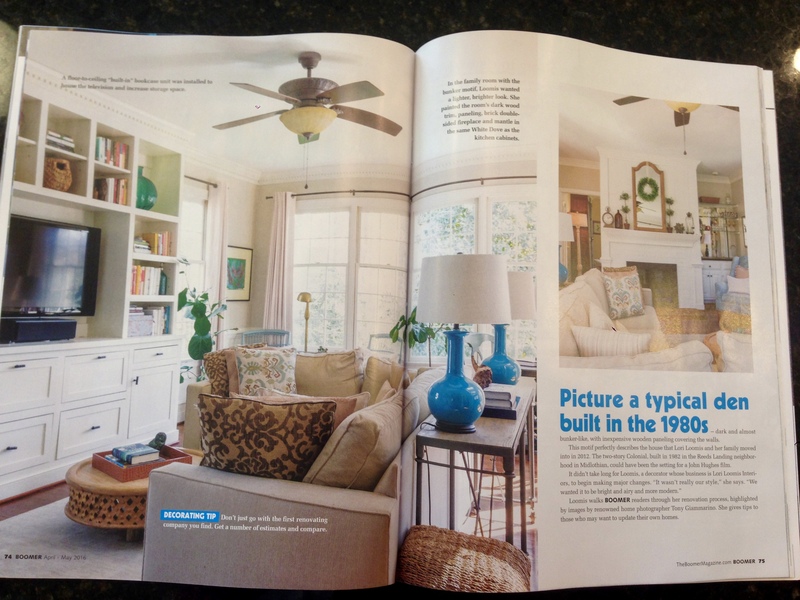 I am so excited to have our home featured in the April/May issue of Boomer Magazine, on newsstands now. 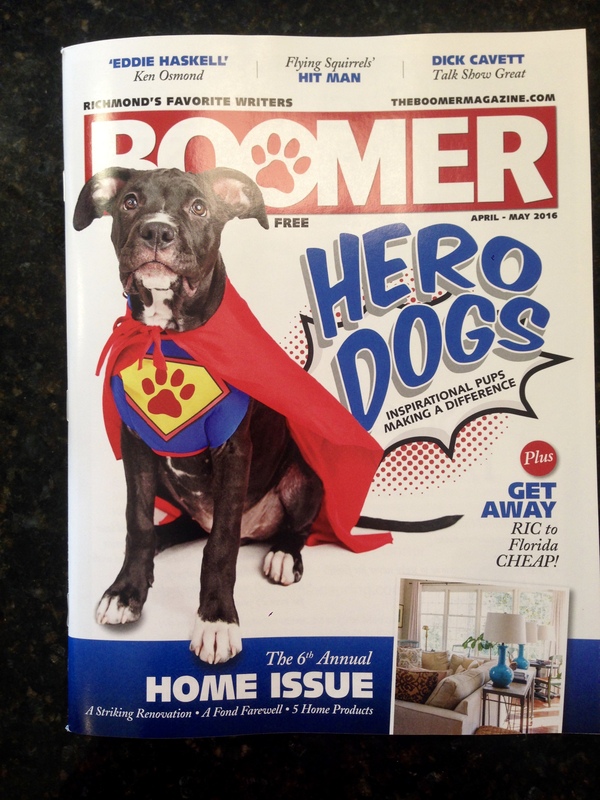 Boomer Magazine is published six times a year and distributed free in the Metro-Richmond area. It’s a great magazine for locals (and beyond! ), with regional features, interviews, etc. If you’re local, pick up a copy today – they have a wide distribution (grocery stores, gyms, etc.). Here are the images from my copy; an online version should soon be available as well. All photos were taken by a very talented local Richmond photographer, Tony Giammarino. 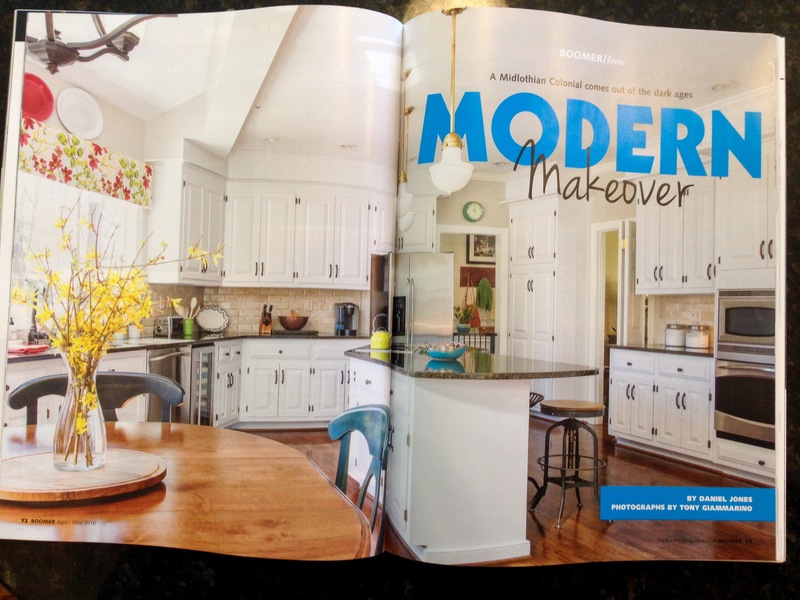 Thanks for reading, and many thanks to Boomer Magazine for their interest in our home! 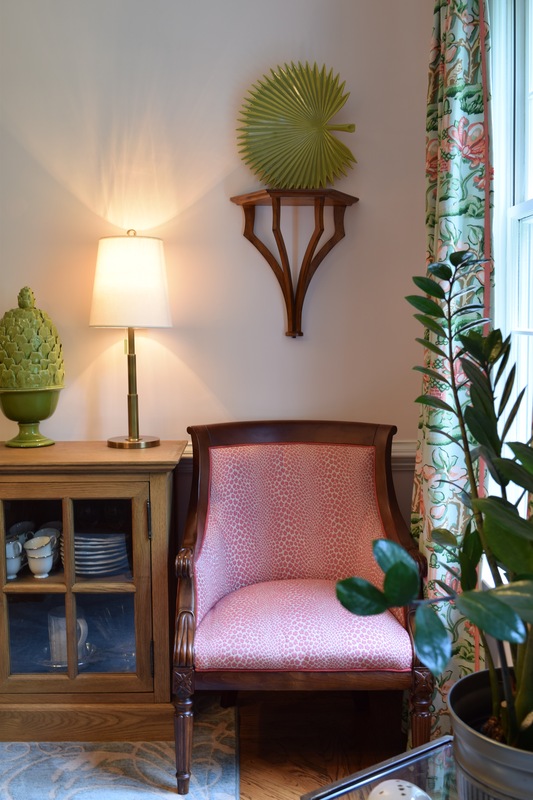 This mini-makeover was inspired by a set of curtains I recently found. 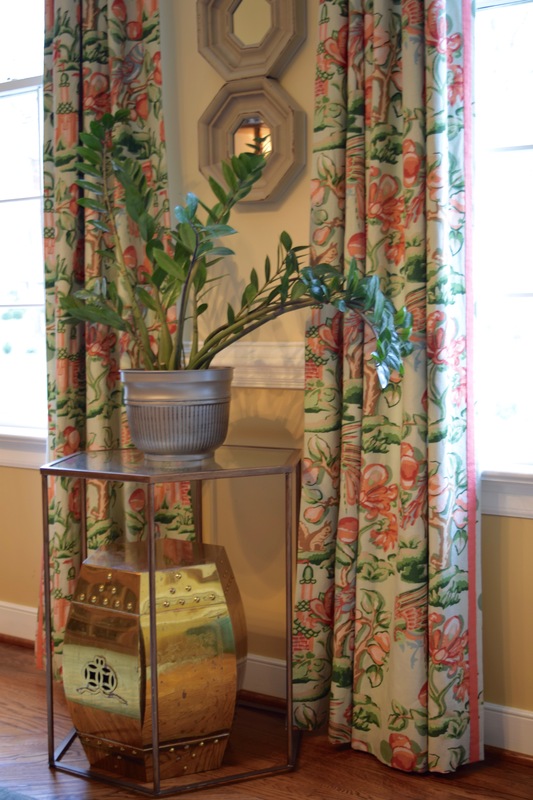 I actually found two panels of these curtains at a local consignment shop (Revival, for those from the Richmond area). 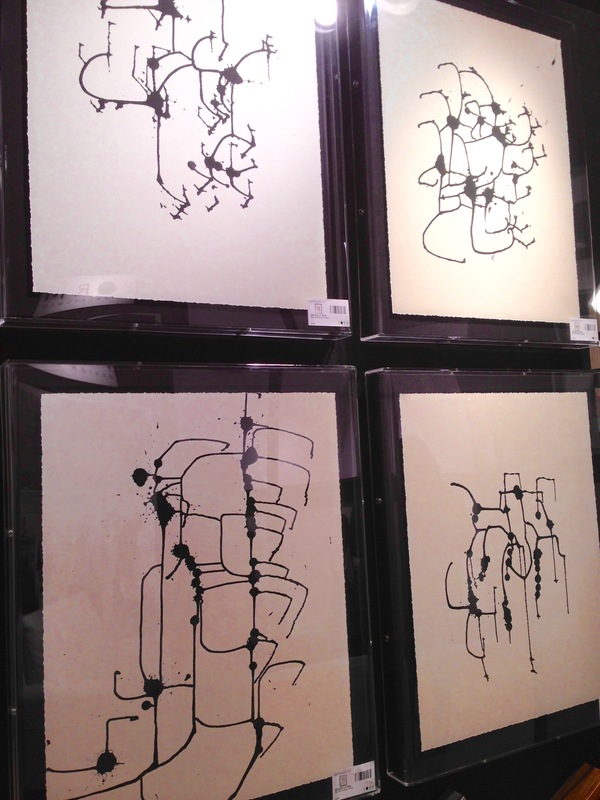 I loved the print, but I have two windows in our dining room – so I needed four panels total. I took them to one of my local seamstresses and had each panel cut in half. She also had to do a little work with the trim – originally, each panel had double trim on the inside of the panel. We took that down to one piece of trim for each panel, so we had a total of four. 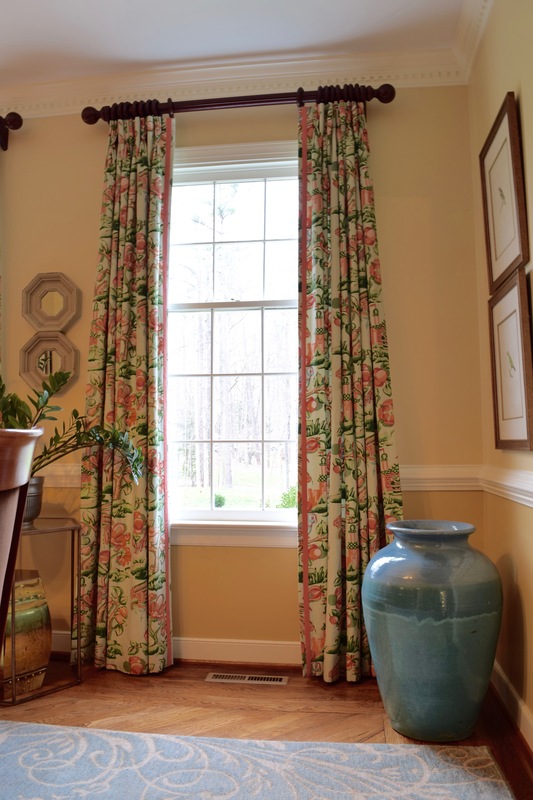 I’ve had curtains divided in the past – it’s an easy enough fix as long as the panels are wide enough to begin with (and fit your windows in terms of height). I would say that once divided, you want at least 24-30″ for each pleated top. I like that they are still full but let more light into the room. 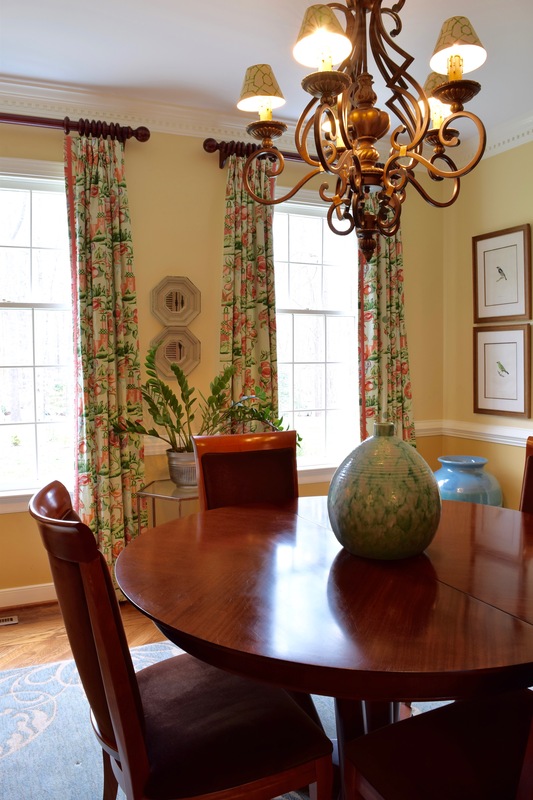 A note about hanging curtains – generally, you want to go high and wide on the windows. Be careful with the length of your curtains, however. You can go one of three ways – 1.) about 1/2 inch shorter than the floor (as seen above), which keeps the panels from getting dusty, 2.) 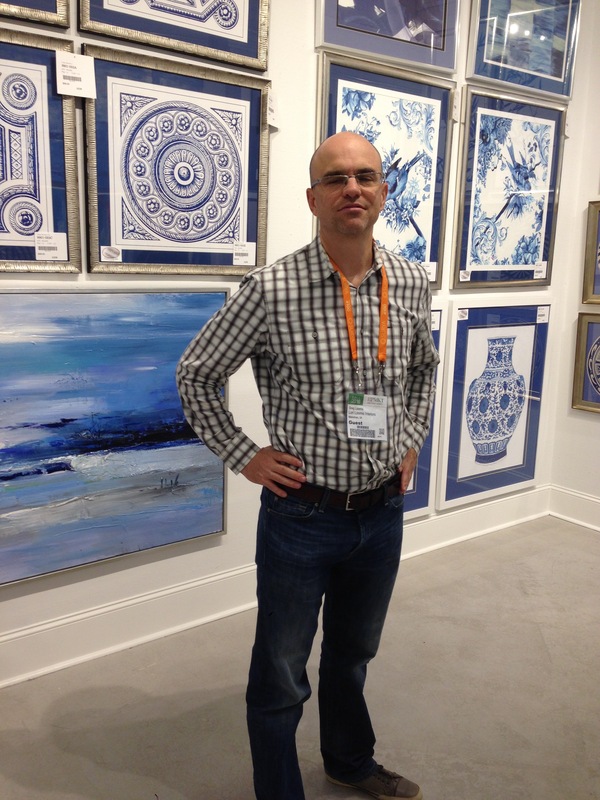 just hitting the floor – looks very tailored and crisp, but is tricky to pull off with exact measurement, or 3.) 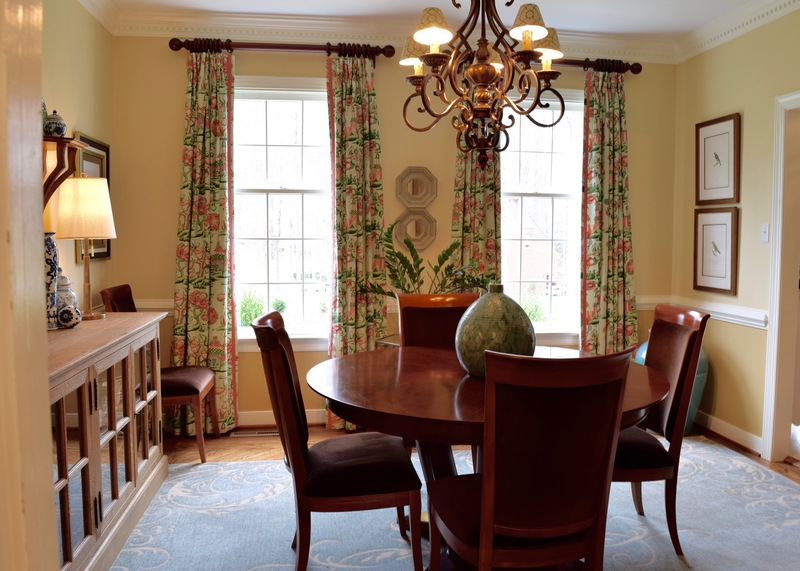 a break on the floor or full puddle – harder to keep clean, but gives a luxurious look to the drapes. We had the buffet/credenza in the room before (in fact, I didn’t buy any new furniture for this mini-makeover), but I did change up the arrangement above the buffet. I got a new mirror (an antiqued piece from Mitchell Gold + Bob Williams), as well as the wall shelves (from Global Views, purchased from another great consignment shop in the area, Izzie’s). I had the lamps already, so it wasn’t too much to change out (although Greg did NOT love hanging the new, super heavy mirror). It’s a little crooked, but I’ve been unsuccessful so far at getting him to fix it, ha!). 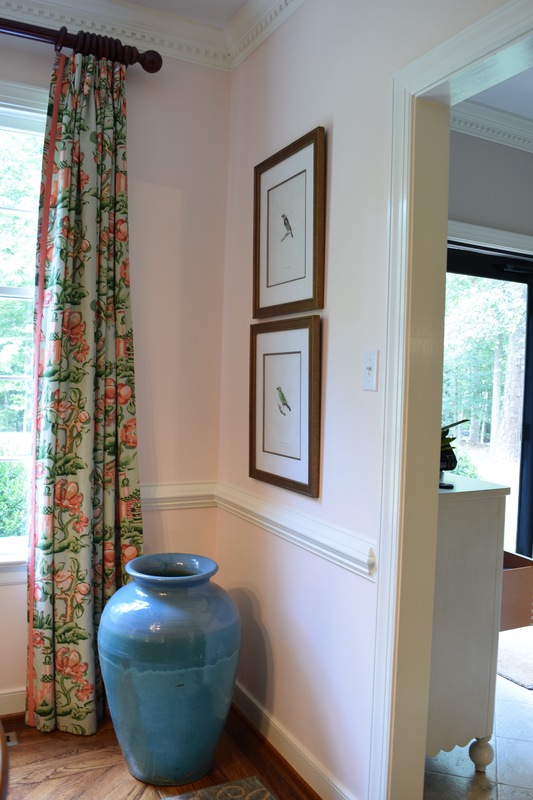 The large vase and bird prints are also new (well, the prints are quite old, but I reframed them in a more modern frame). The vase is beautiful and apparently pretty rare, but I got it discounted because it sustained some damage at some point (strategically hidden). 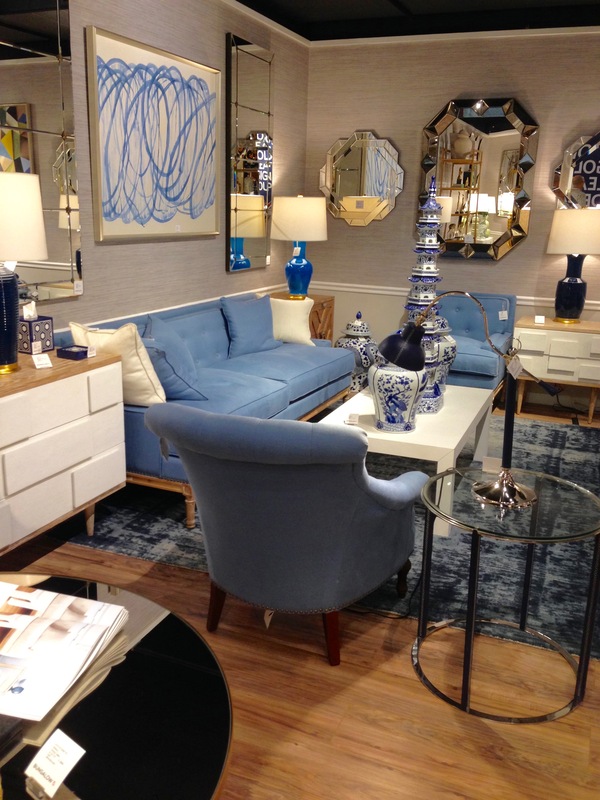 I’ve been playing around with the arrangement on the credenza, but going with the blues and whites for now … I also have a few plates that I might hang in between the two windows (in place of the mirrors). 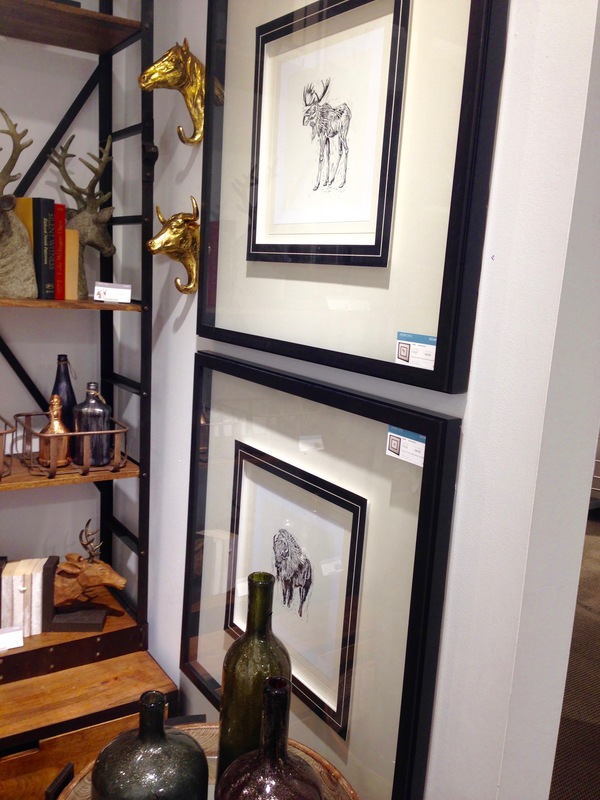 Here’s a close up of the art flanking the buffet. They are two abstract prints that are slightly different, but I thought something calming and modern would look good in the space. 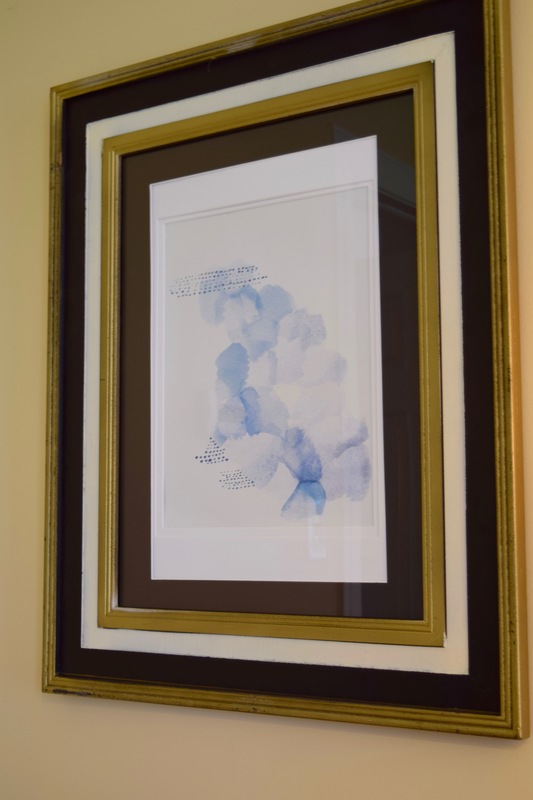 I purchased the prints from Etsy and framed them myself. 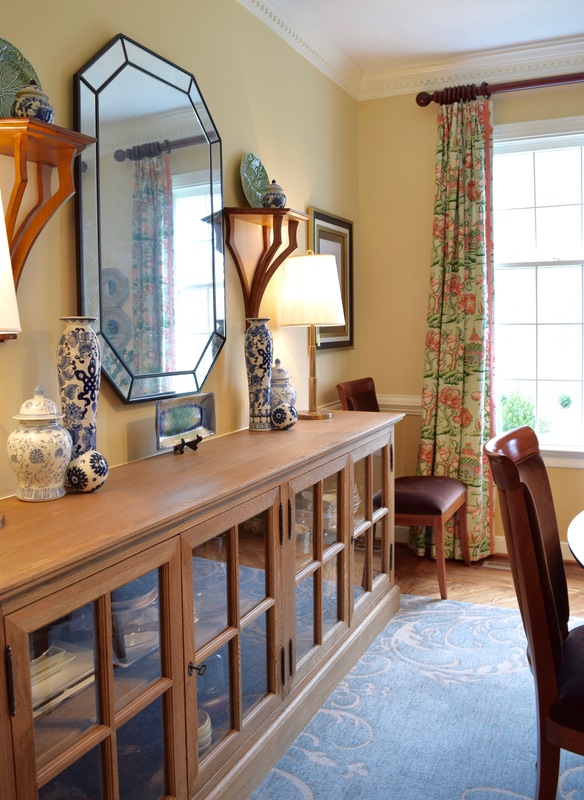 I’m going with the symmetrical look for the buffet – hoping it looks interesting but that the symmetry is a grounding/calming element in the room. I would like to change the paint color at some point, but it’s not too bad, and that feels like a big undertaking with all of the things I have hung on the walls. As much as I’ve painted furniture, I’ve actually never painted walls. Might be a summer project, we’ll see! Hope you enjoyed reading the post! 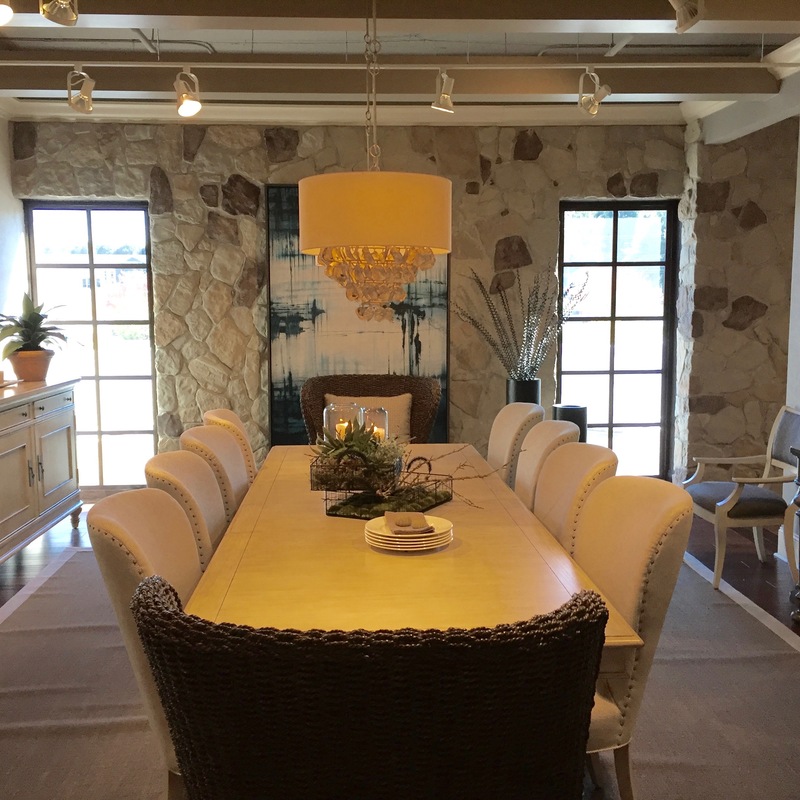 I was recently hired by a great couple with three young children to design the family room in their newly purchased home. 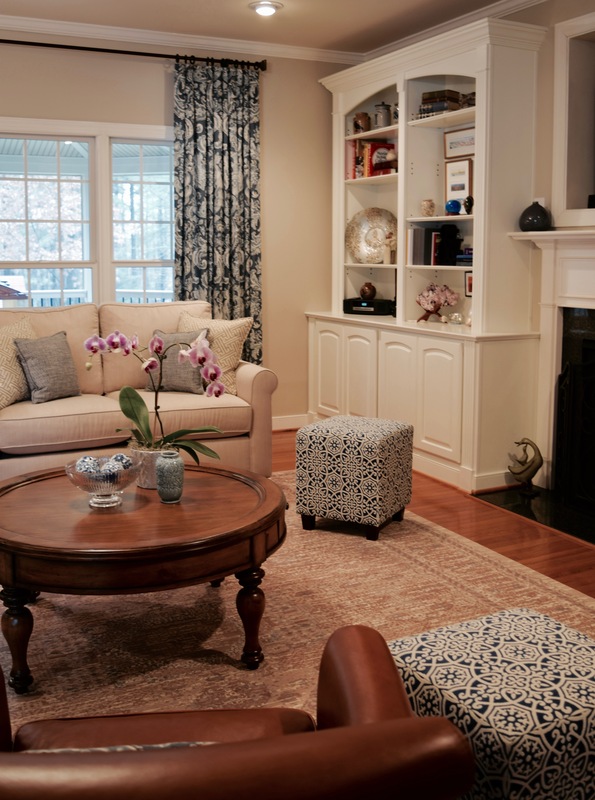 They were ready to invest in a family room that would be comfortable, cozy, and “adult” – while still being family friendly. Here’s what we came up with. Luckily, they were able to bring me on board to start work on the project before they moved into the space. Here’s what the room looked like the first time I saw it. It’s a great space with easy access to the kitchen and entry foyer, but it was lacking in architectural interest and didn’t have any storage. 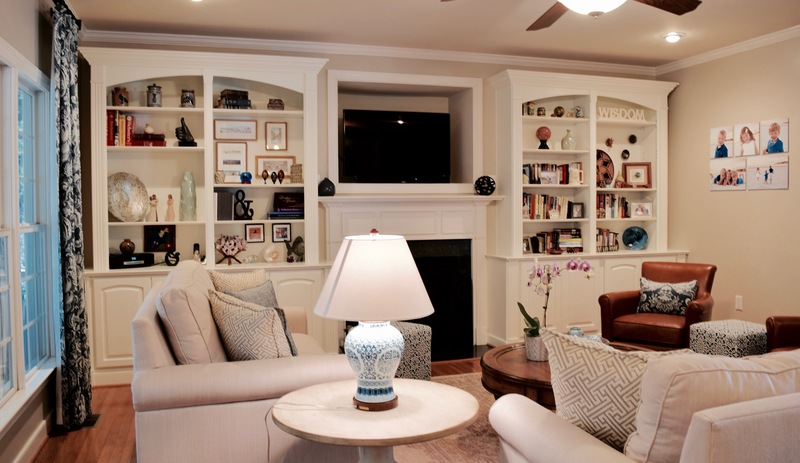 For a busy family of five, storage was essential, so we first started with the built-ins. 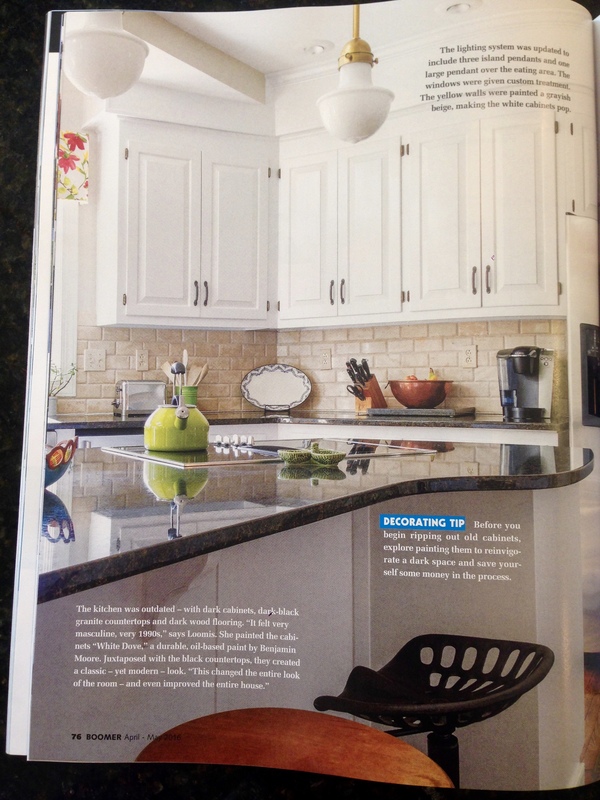 They used a local Richmond carpenter who did an excellent job on the built-ins. We showed him pictures of the desired look, and he added a few touches as well. I think they turned out great. They are solidly built and high quality. Here’s a better look. The windows to the left of the built-ins look out onto a covered porch. It’s a nice, usable layout but left the family room feeling dark. Here’s another before picture of the windows. The blinds and drapes weren’t helping the issue, so we went high and wide with a dramatic print for the custom made drapes. 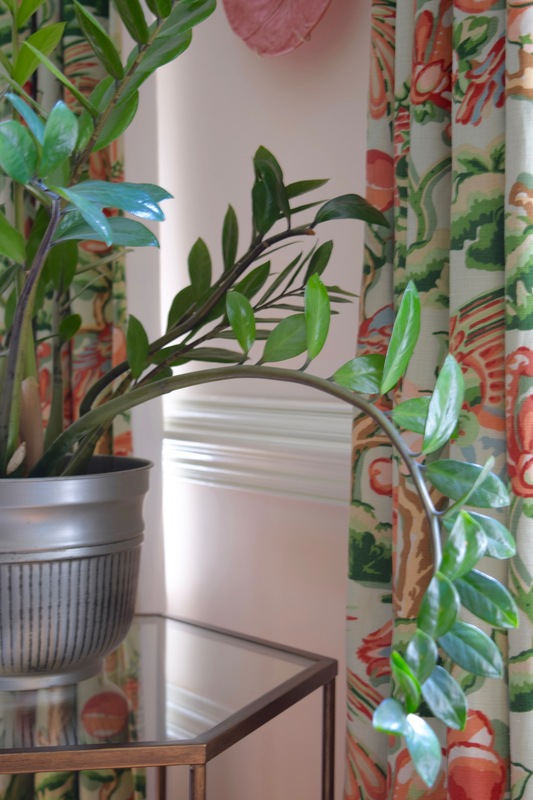 It’s a good rule of thumb to go “high and wide” with your draperies – it adds visual height to the room and helps to make the window more dramatic. 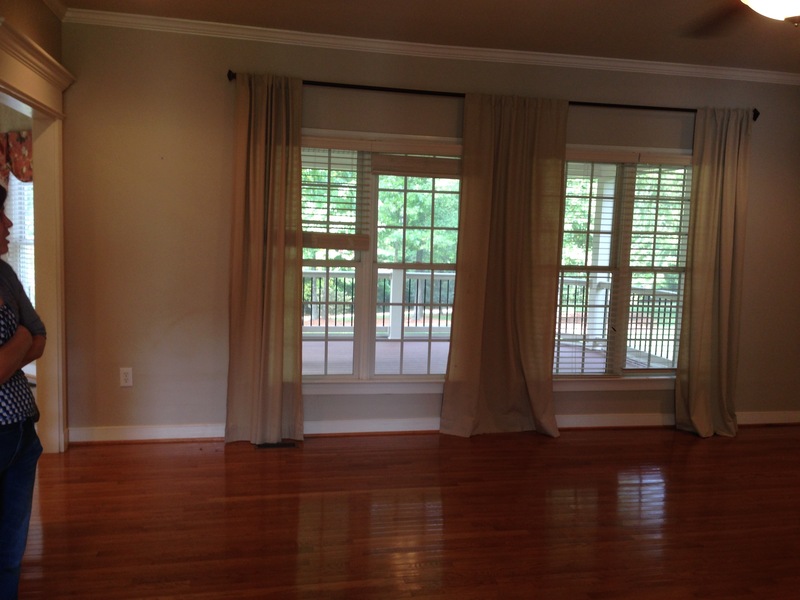 They used the existing rod for now but will likely purchase a new, thicker wooden curtain rod that matches the honey finish on the coffee table. 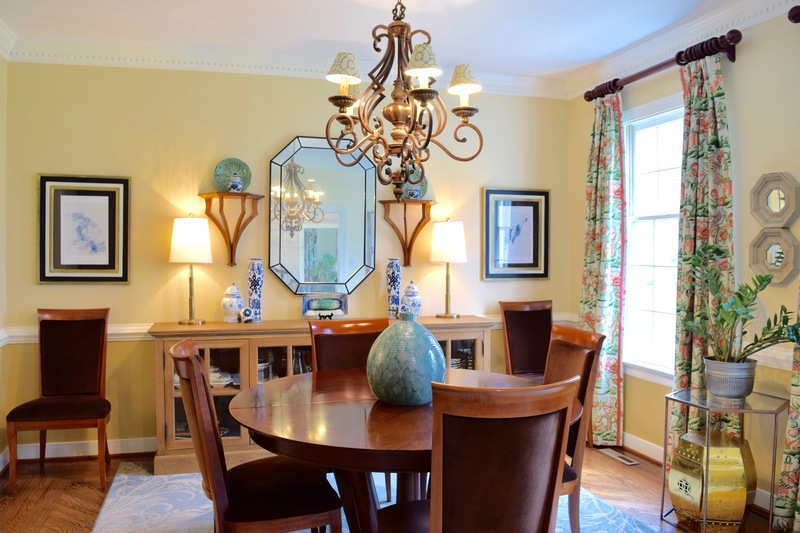 They also added recessed lighting – which really helped make the room much lighter and brighter. 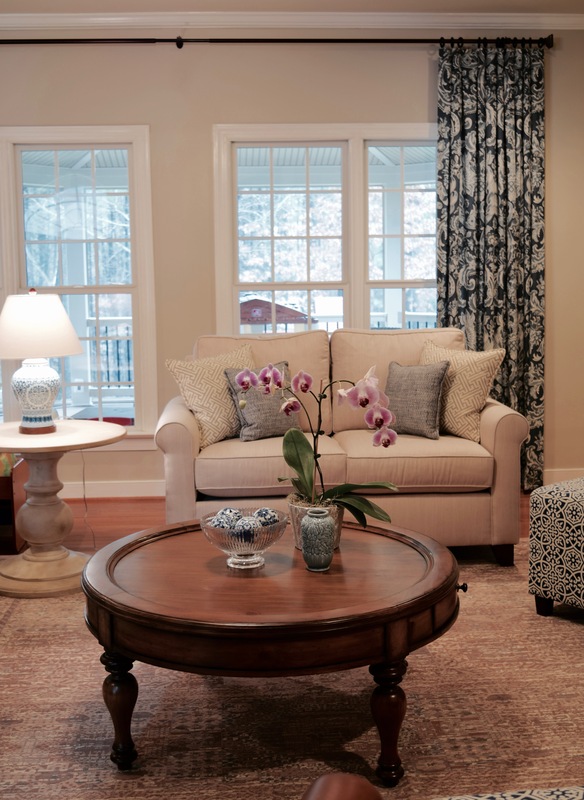 To make the room more family friendly, there are mostly rounded corners (coffee table and end table) and the couch and love seat are covered in an indoor/outdoor fabric. 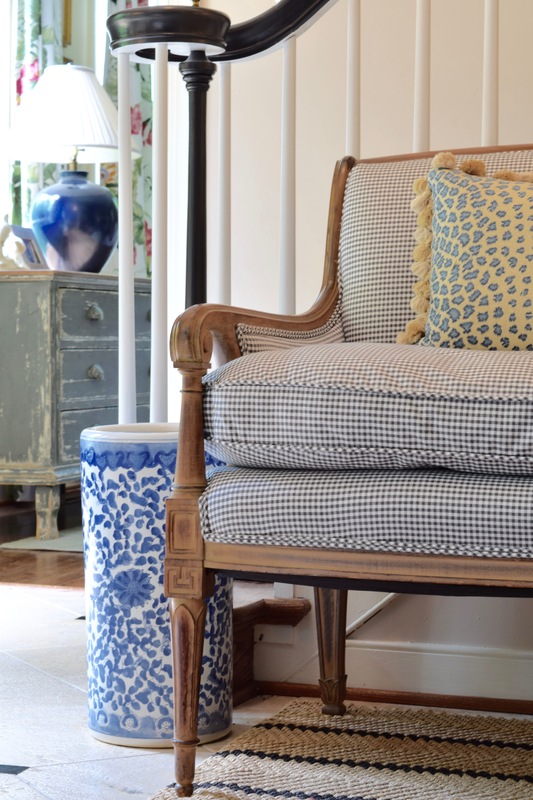 The blue and white ottomans also provide extra seating for family gatherings and can be easily moved. 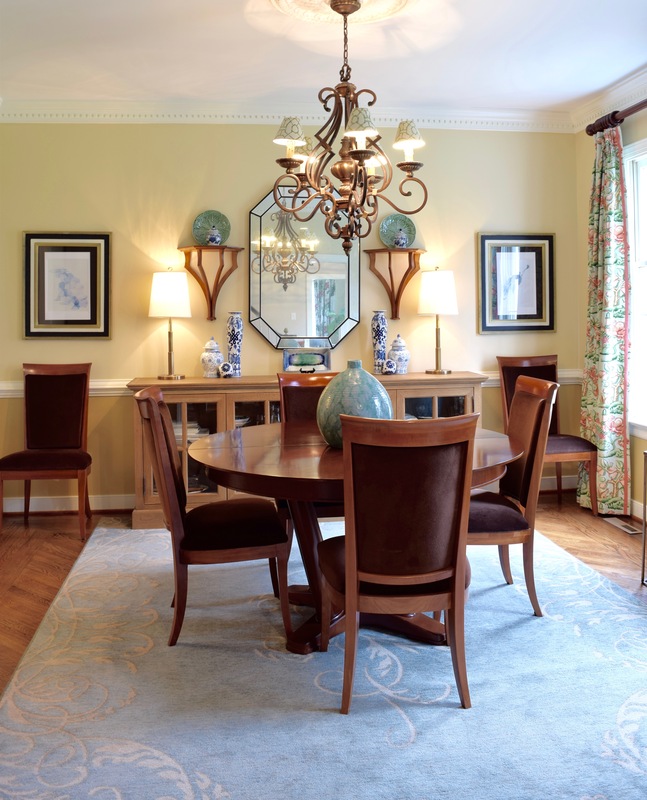 Two leather chairs complete the arrangement and provide durable, stylish seating in the space. All pillows are custom made. I really loved working on this space and am so pleased that the family is enjoying their new room. Thanks for reading!